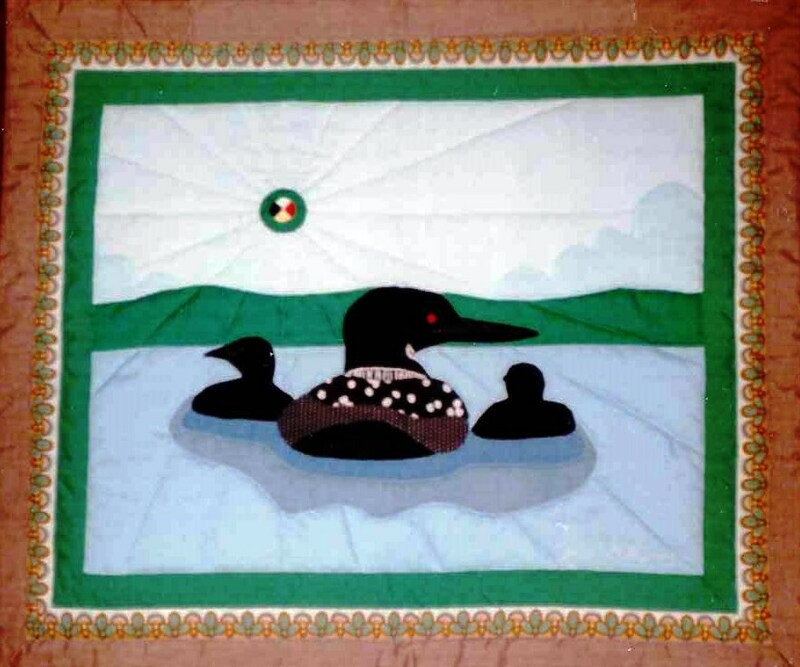 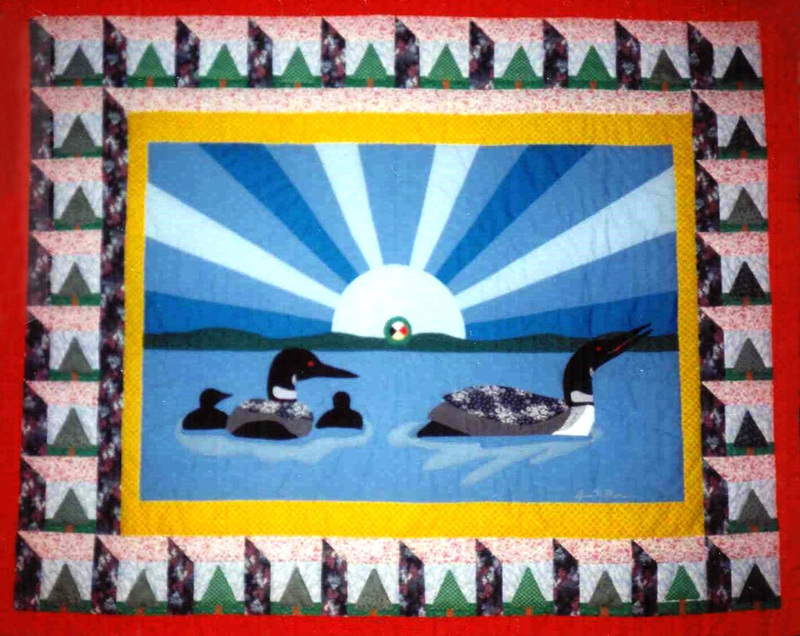 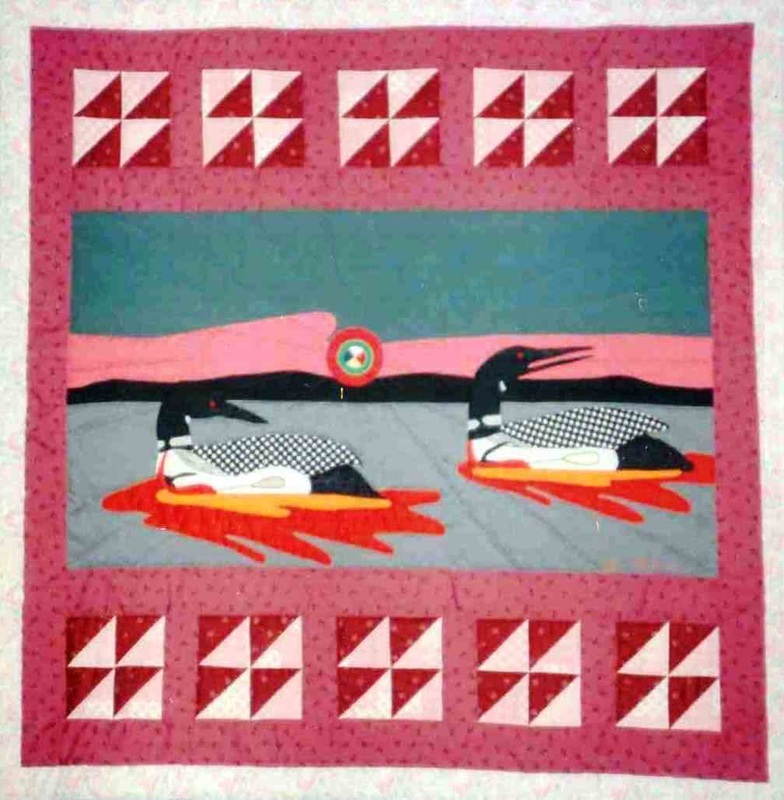 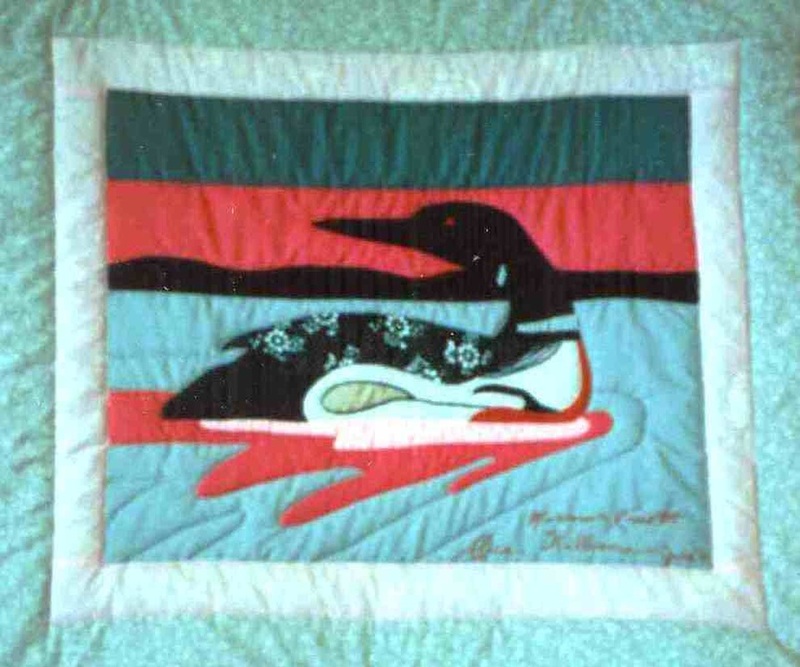 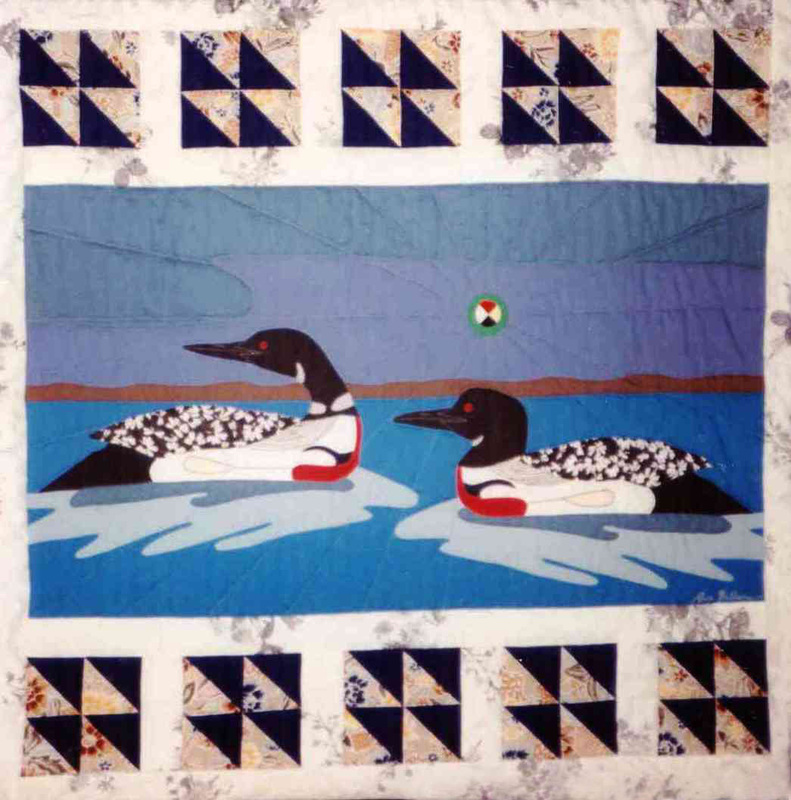 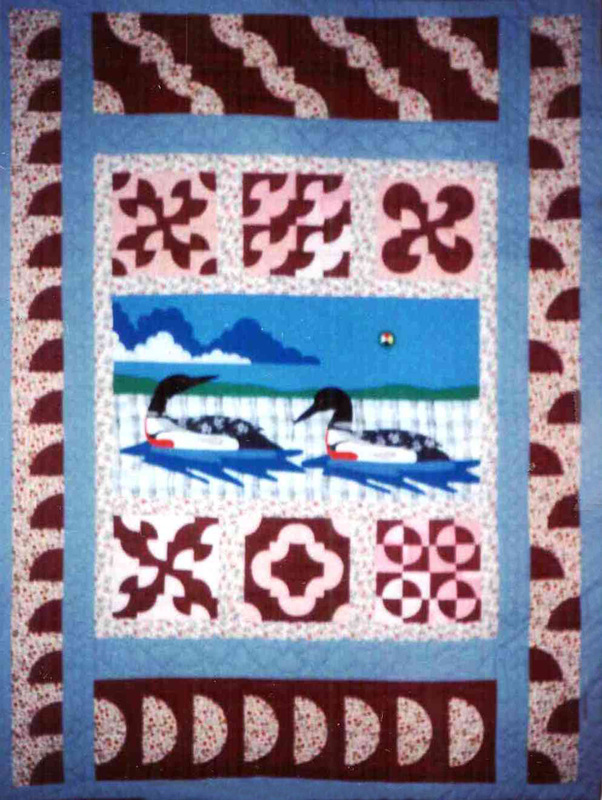 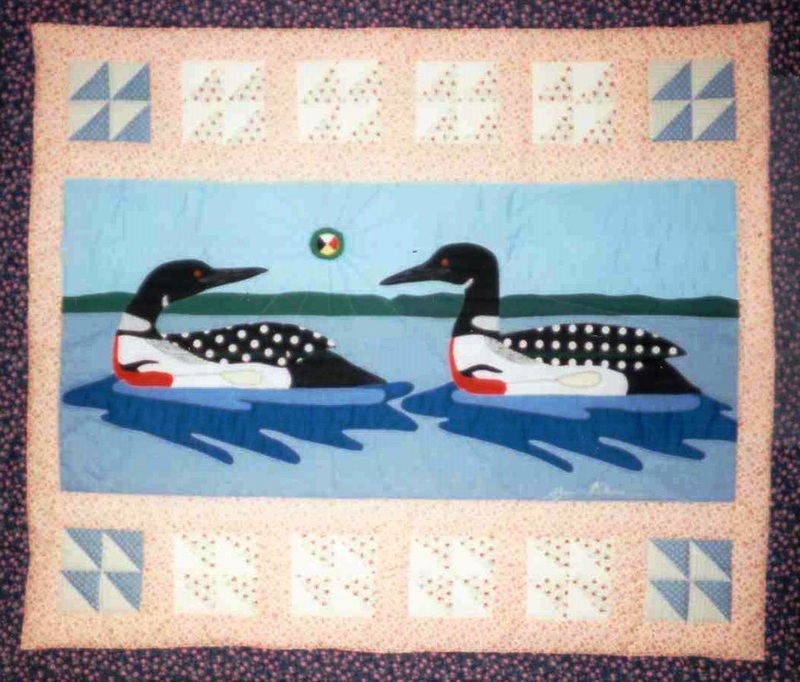 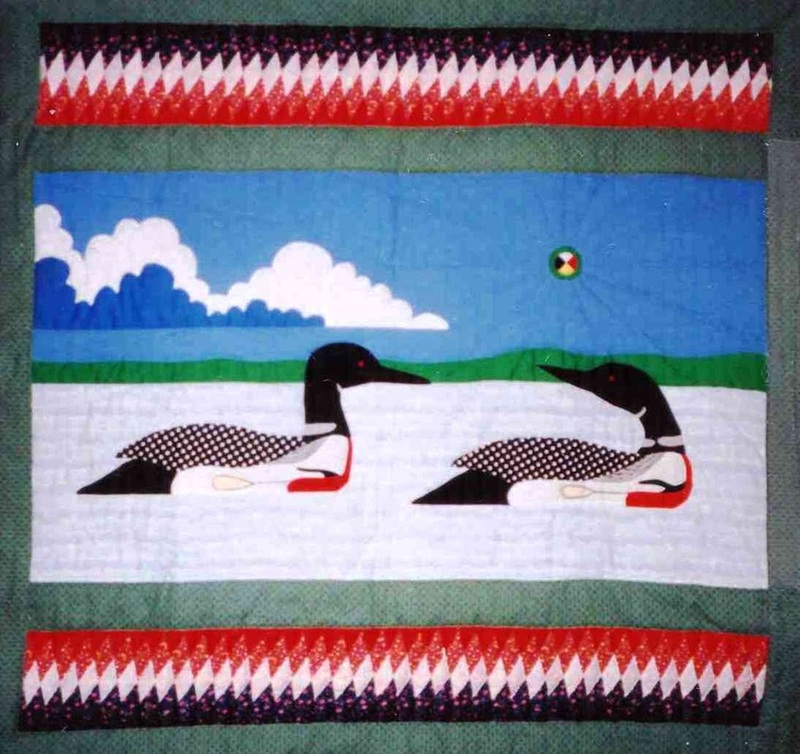 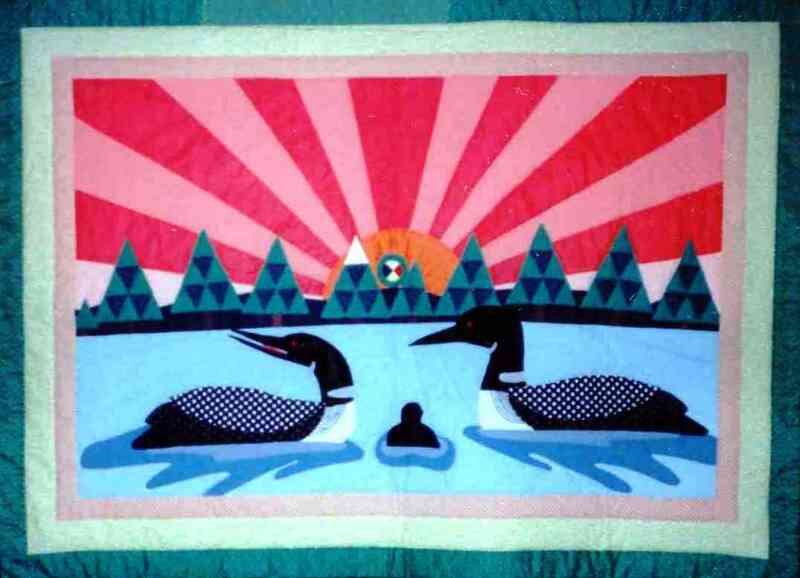 "The loons in my quilts represent patience, and devotion to working together for Pimaatiziwin, that is, striving to live a Good Life. 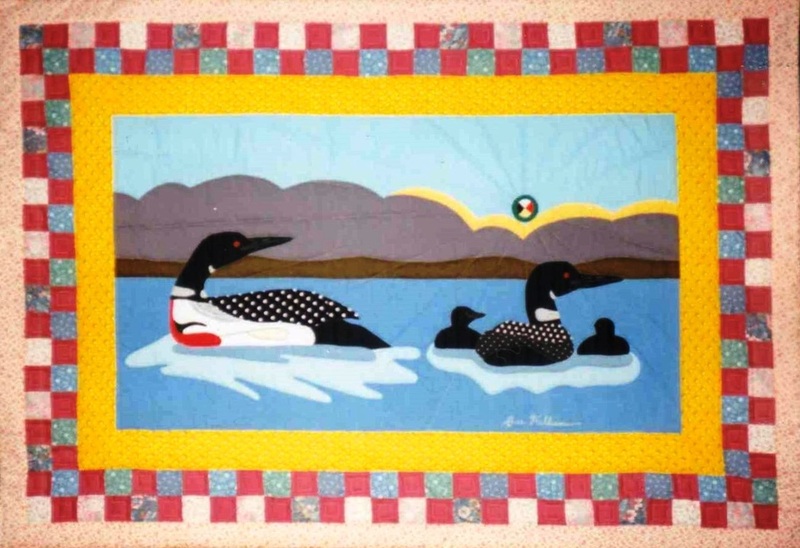 The loons show us that they can float and swim and dive superbly. 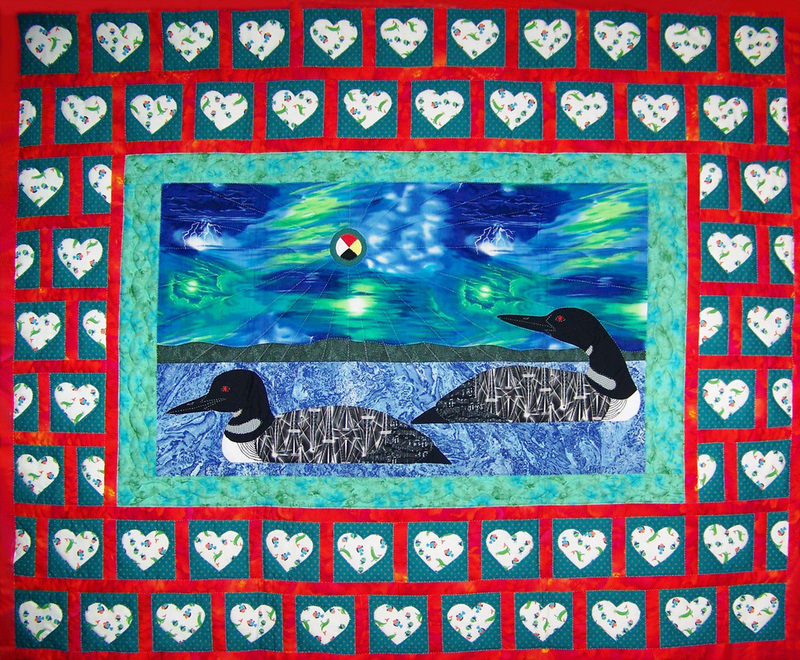 They speak to us of caring and sharing and faith. 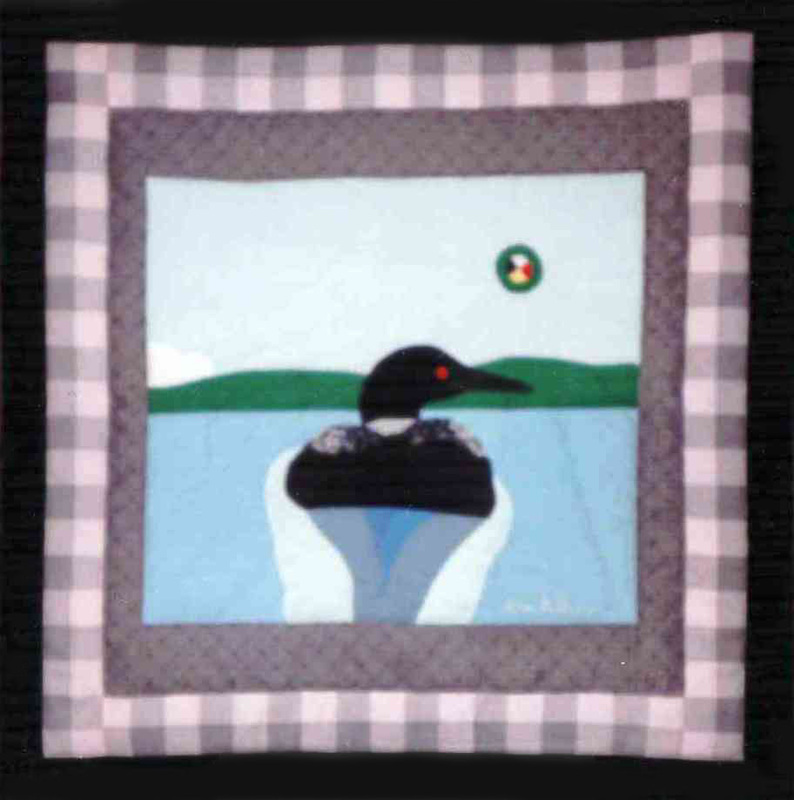 They say to us: 'My feet and my wings are perfectly balanced. 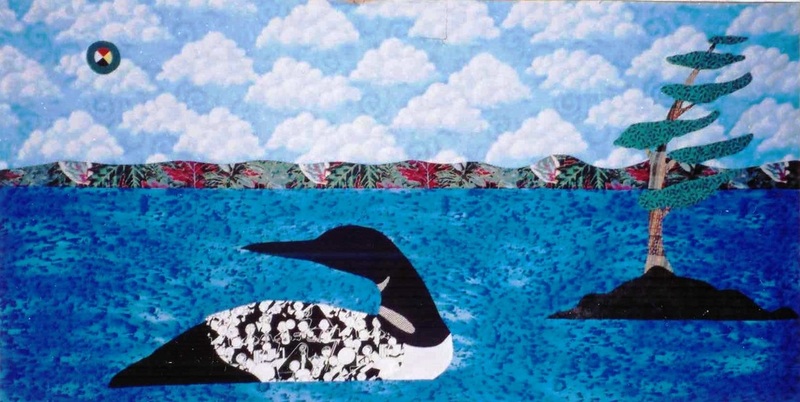 I am like the Peoples of the Earth. 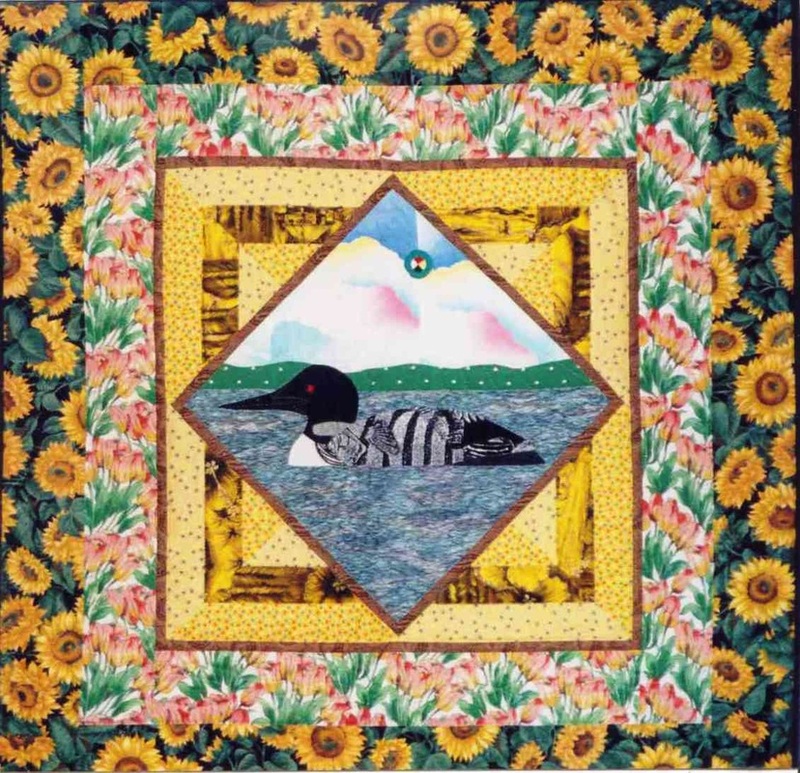 Time and Nature is all around me and I listen and wait patiently to know when and where my next move shall be. 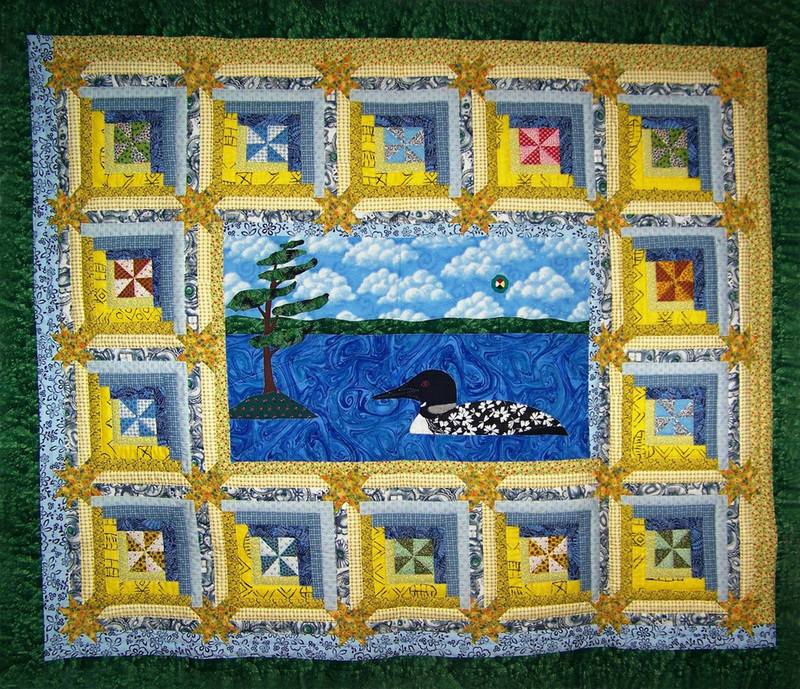 My wings work in harmony and balance. 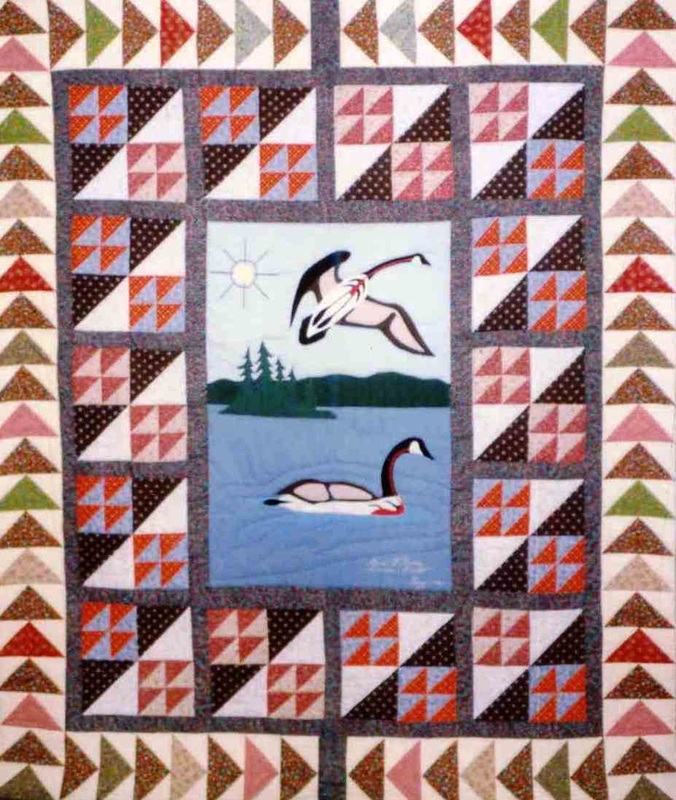 One wing is Man, and the other is Woman. 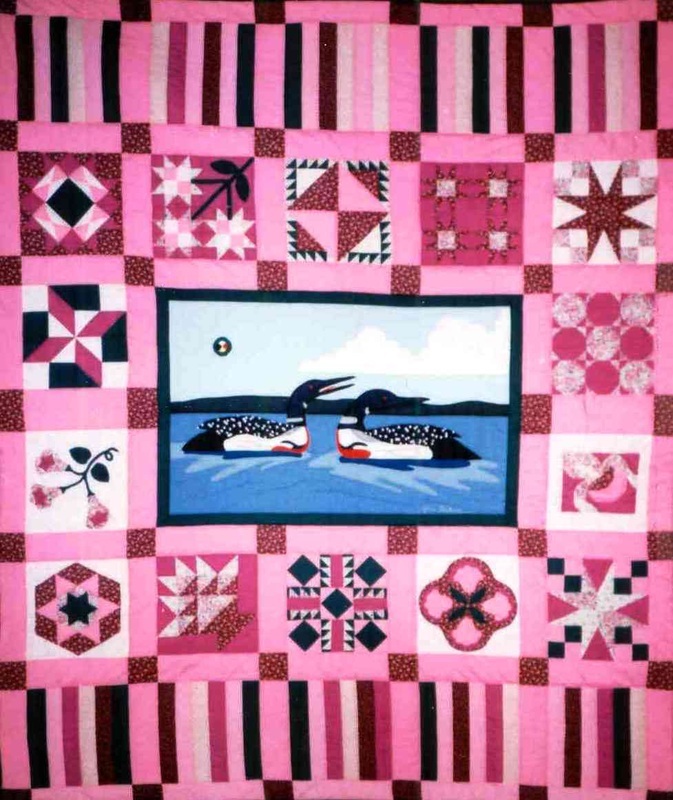 When both Woman and Man have equal power and they are balanced, then the people of the world will live to their highest limits.' 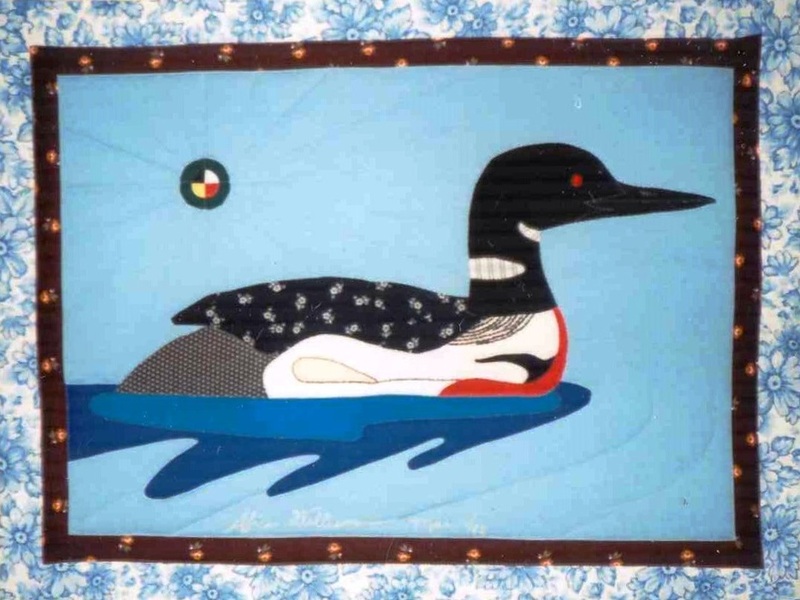 The next time we see Loons, they will tell us even more. 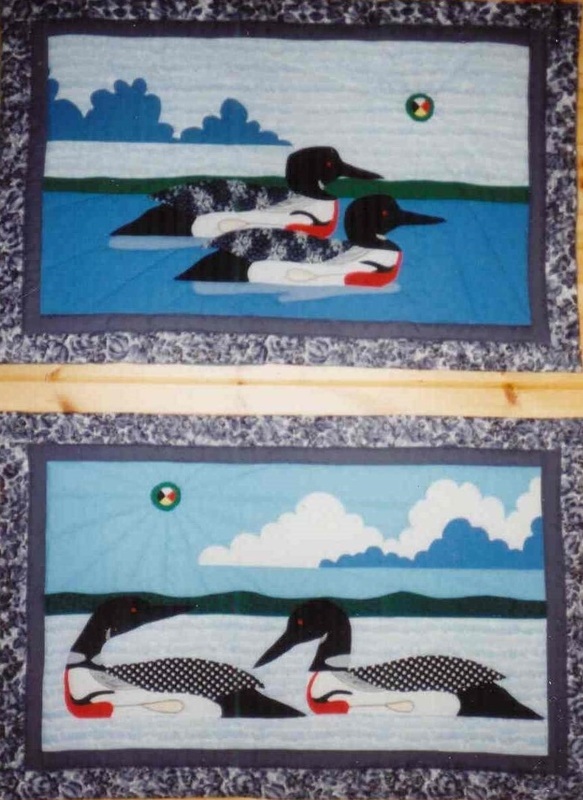 These variations on the loon theme, 97 (!) 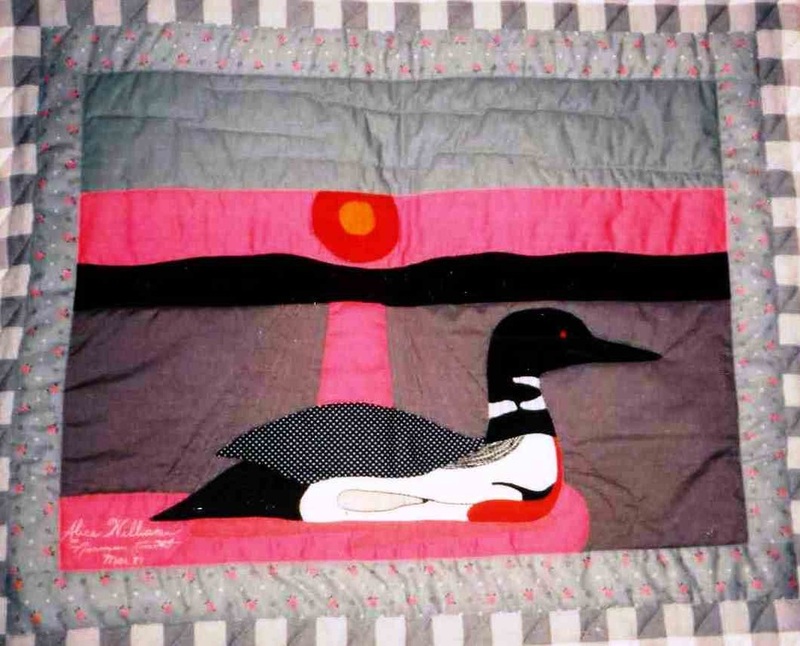 quilts in total, exhibit the breadth of Alice Olsen William's mastery of quilting techniques, creative use of fabric and skill with perspective and rendering in cloth. 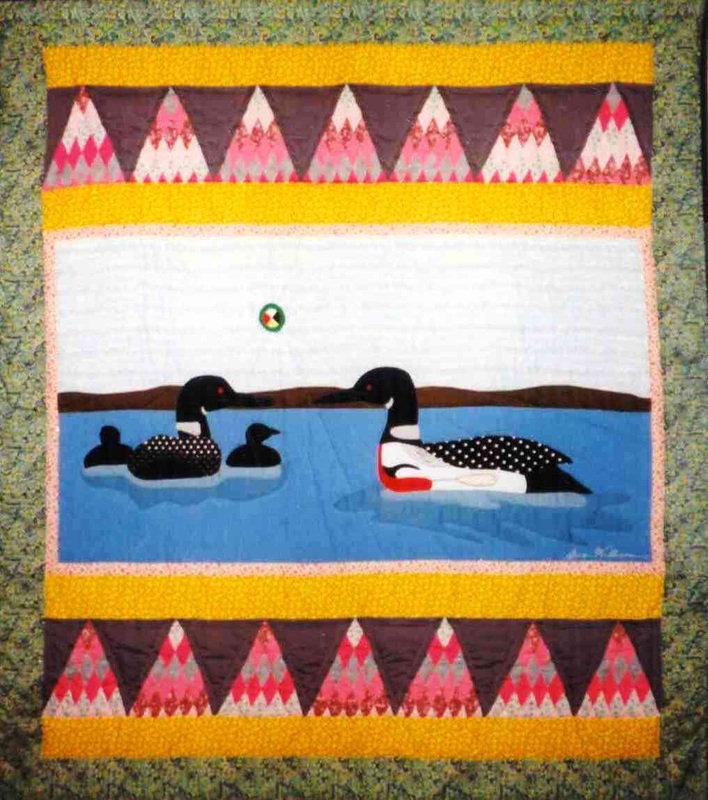 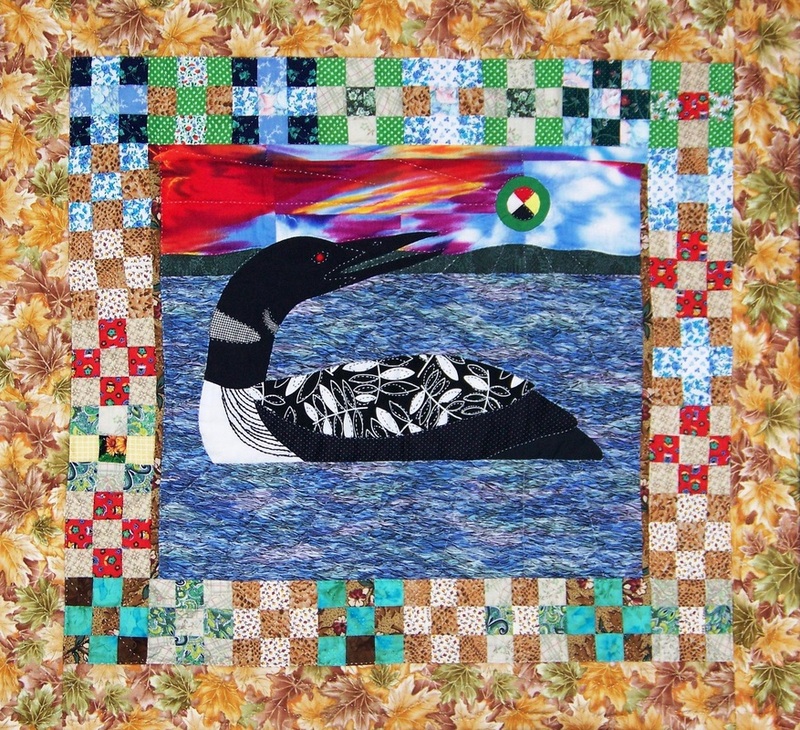 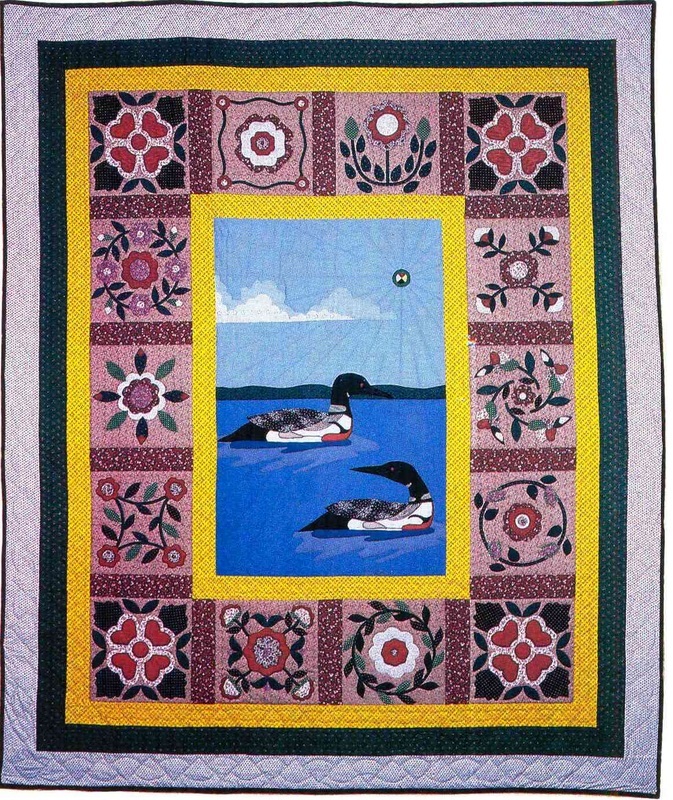 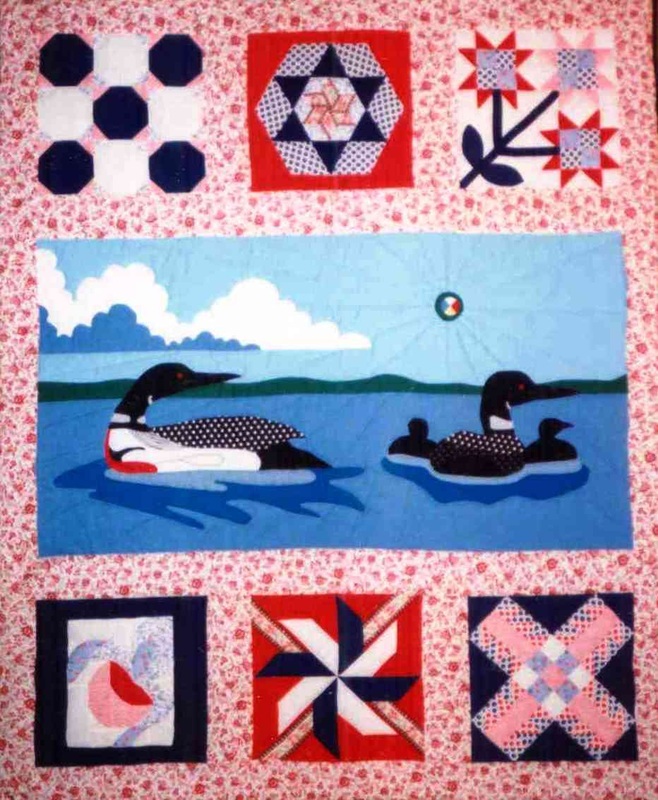 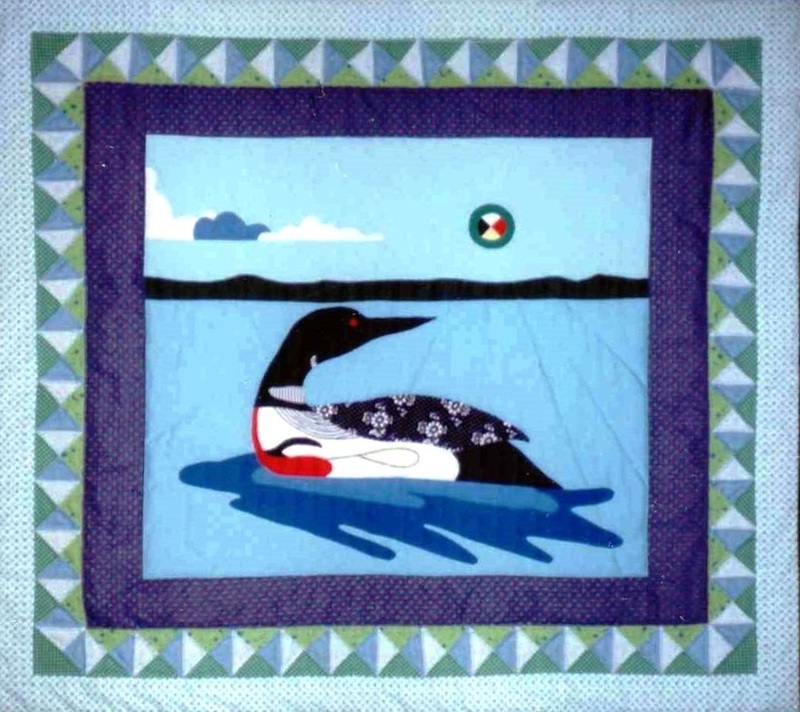 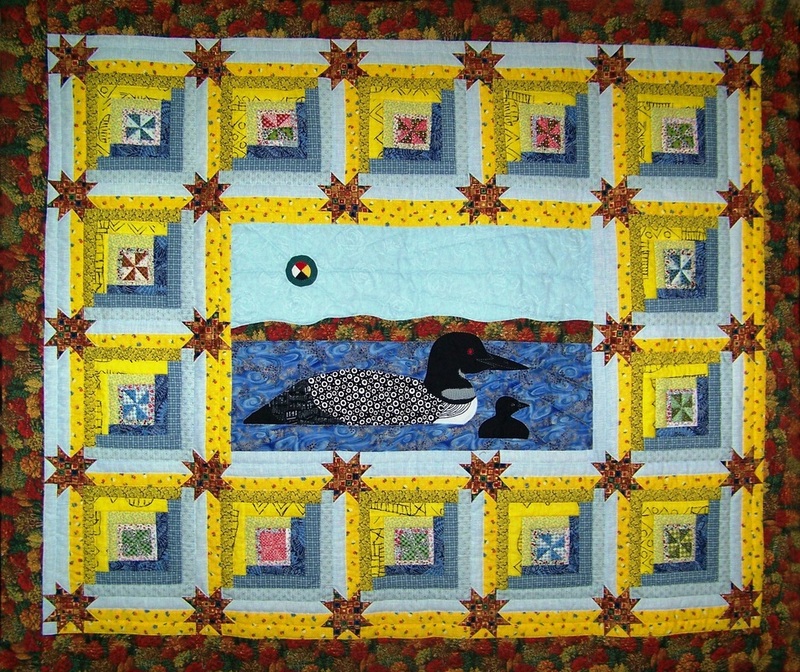 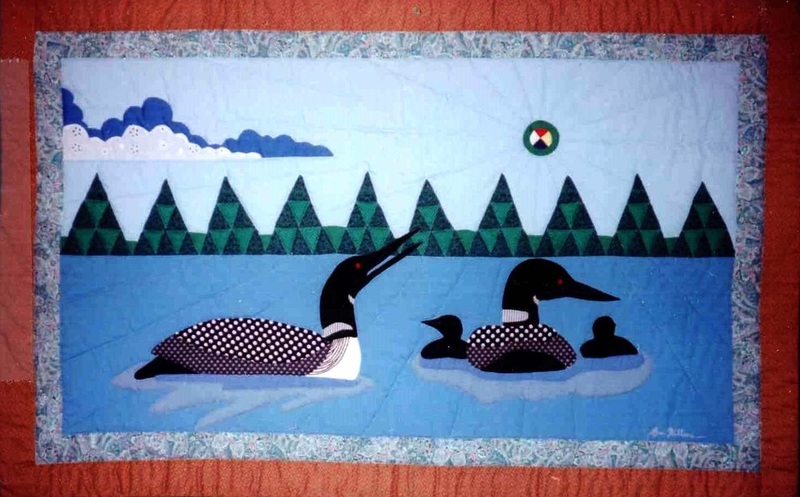 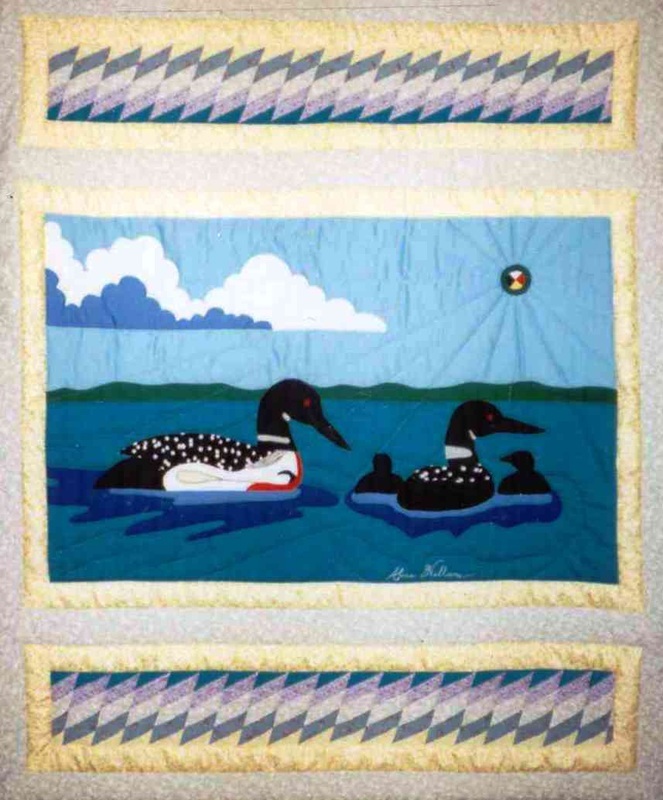 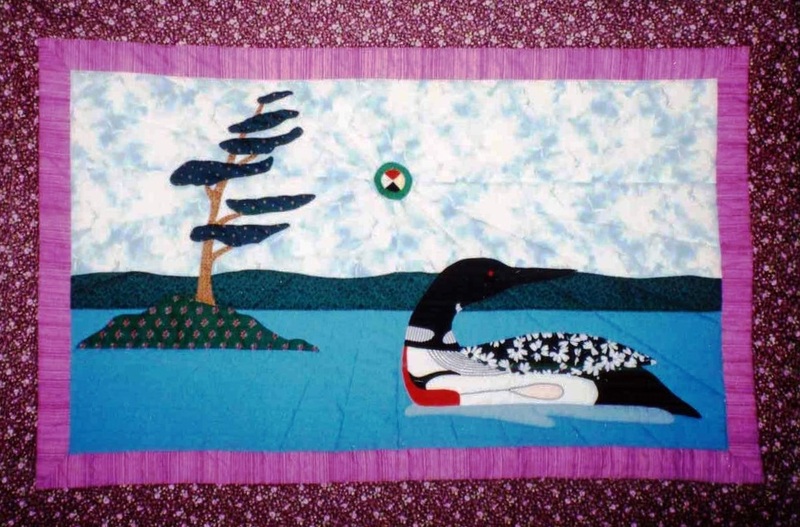 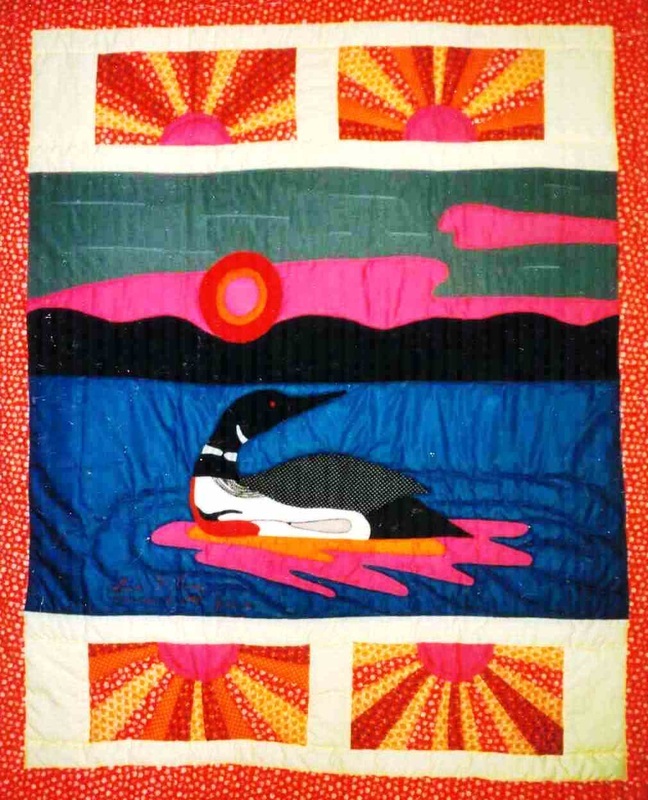 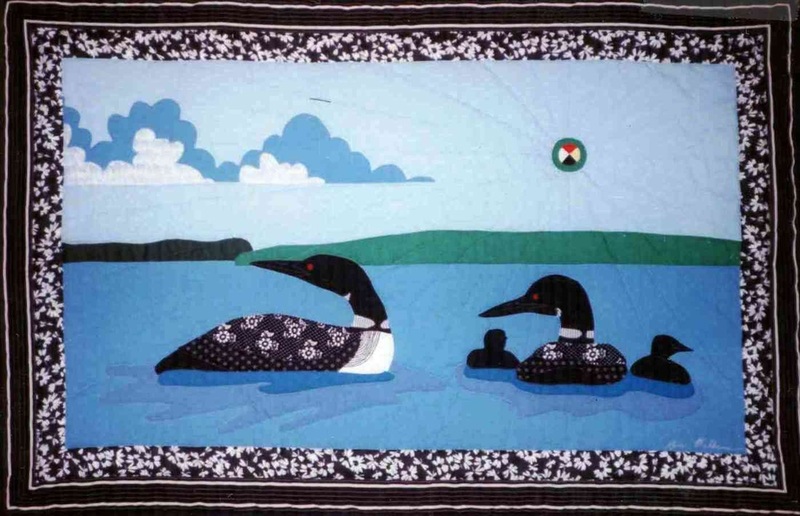 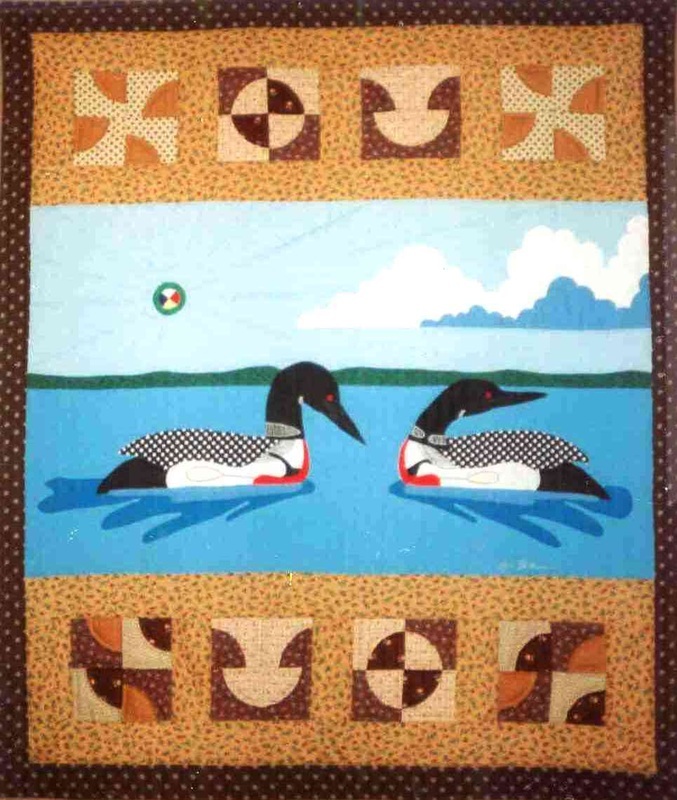 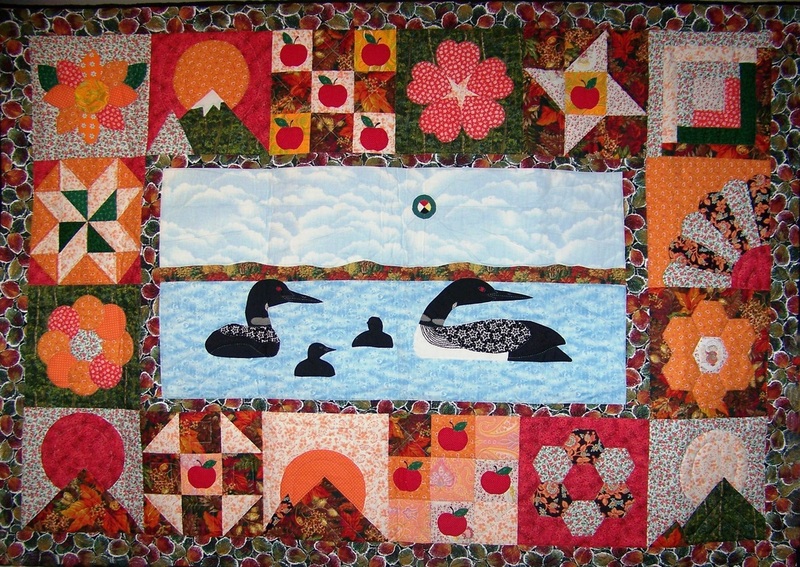 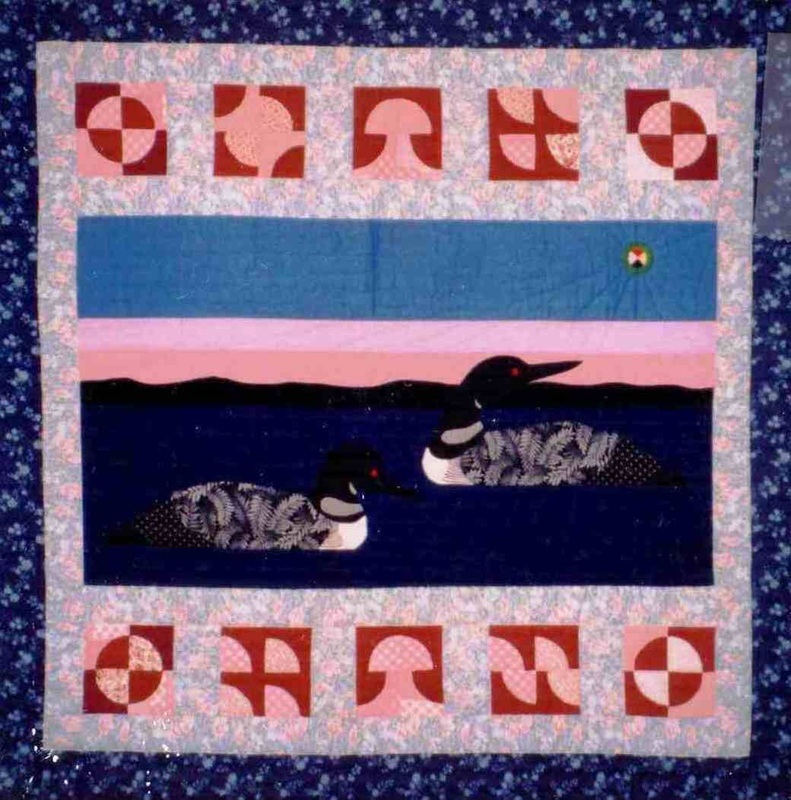 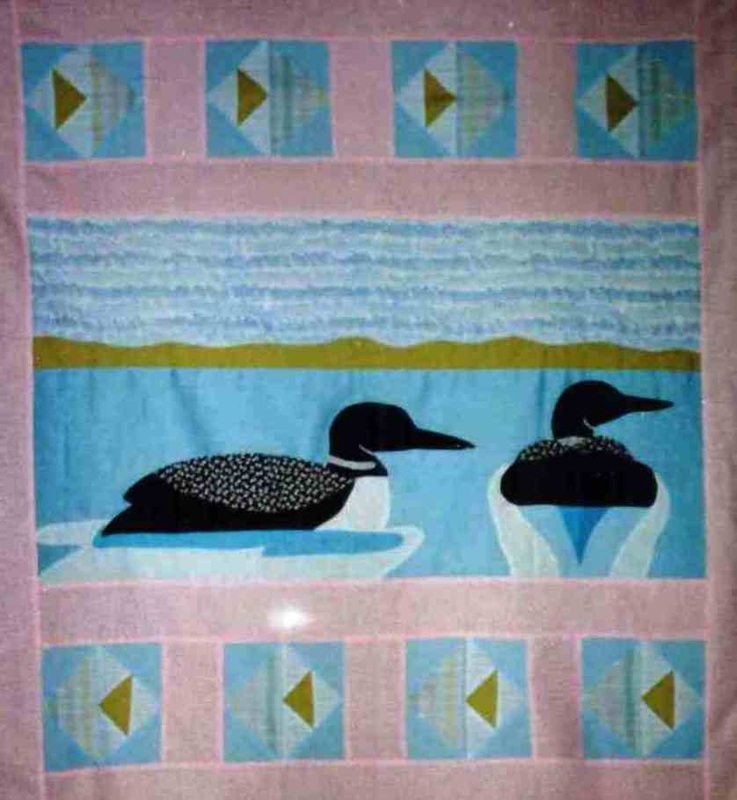 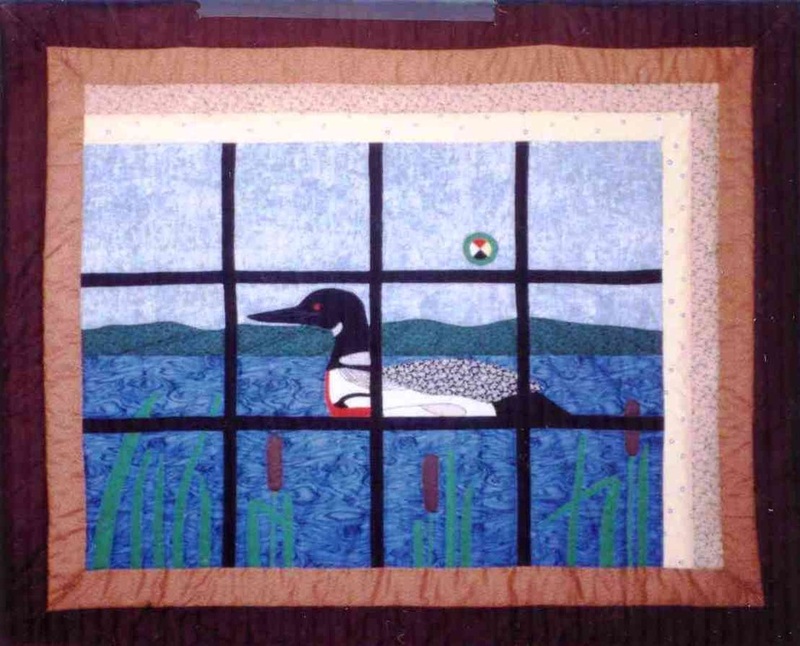 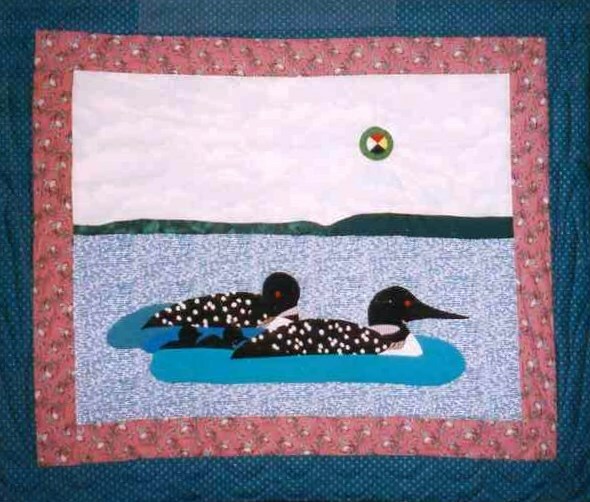 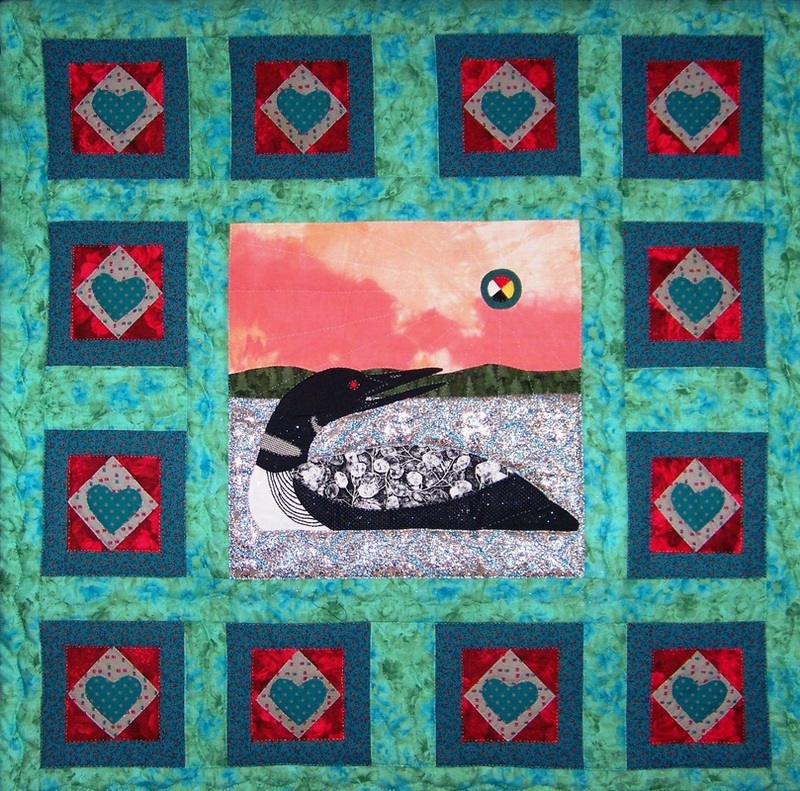 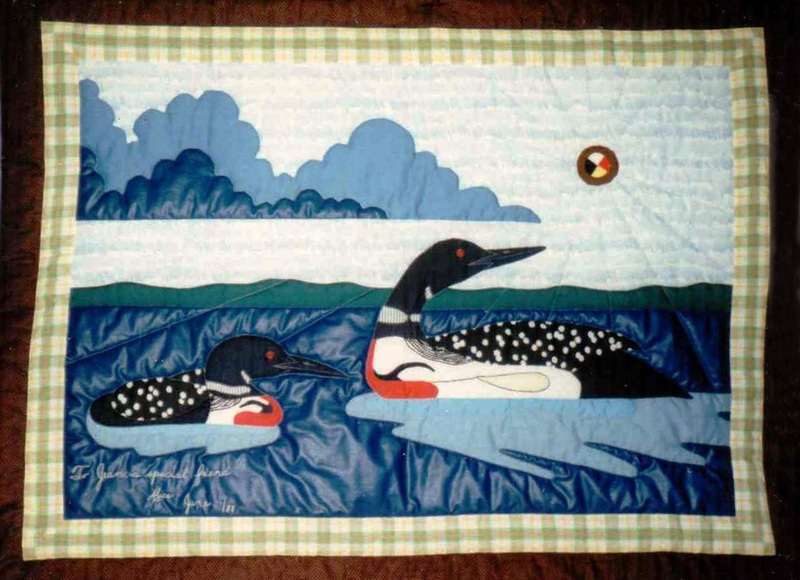 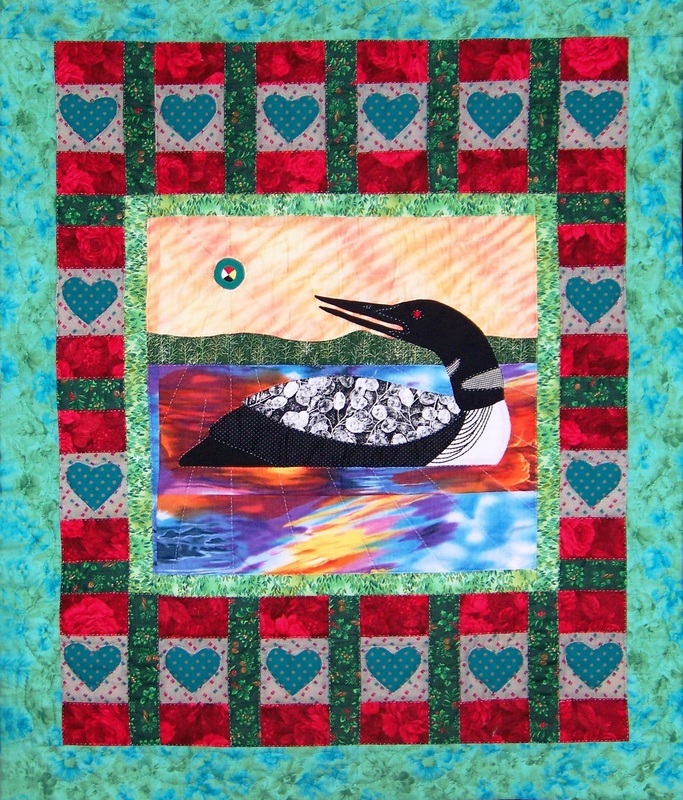 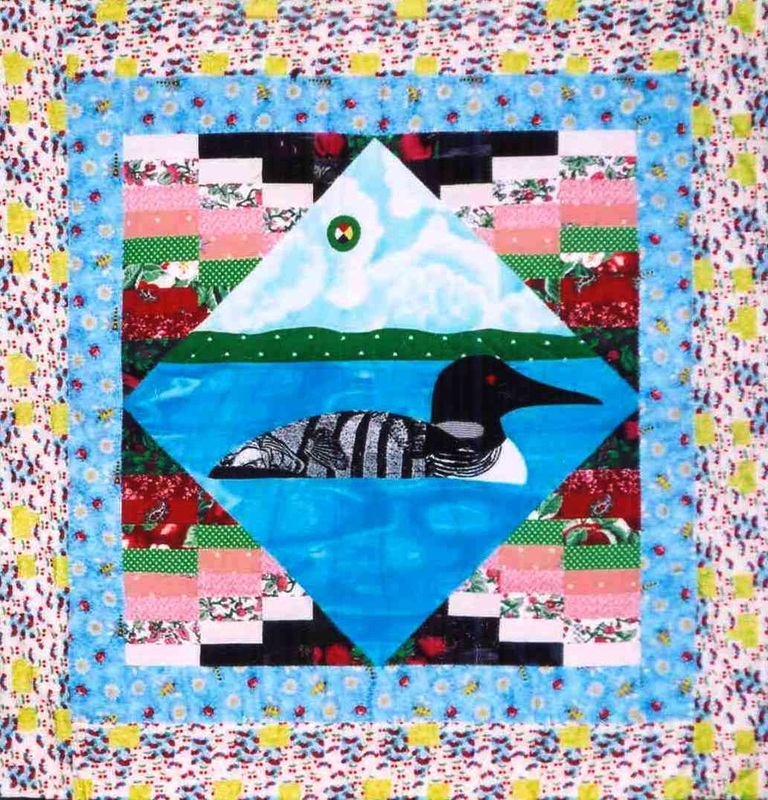 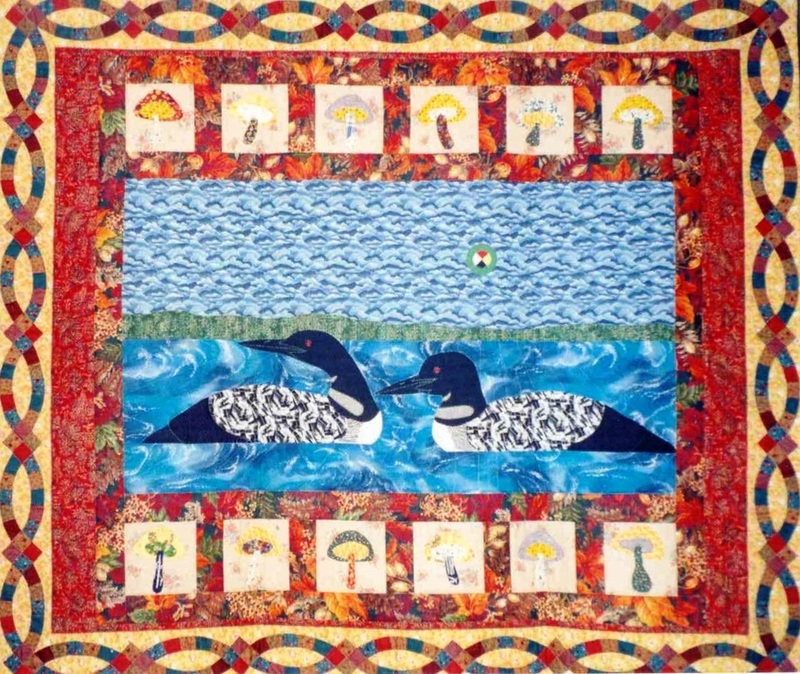 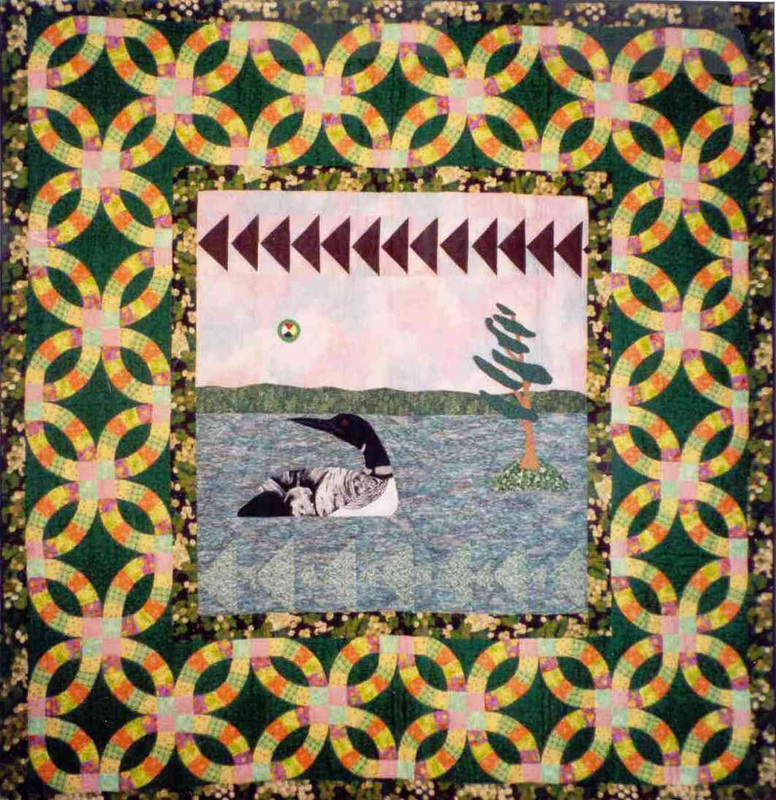 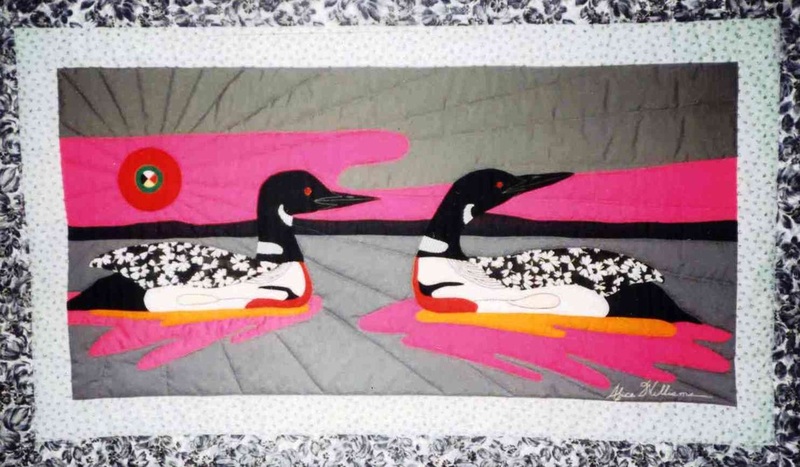 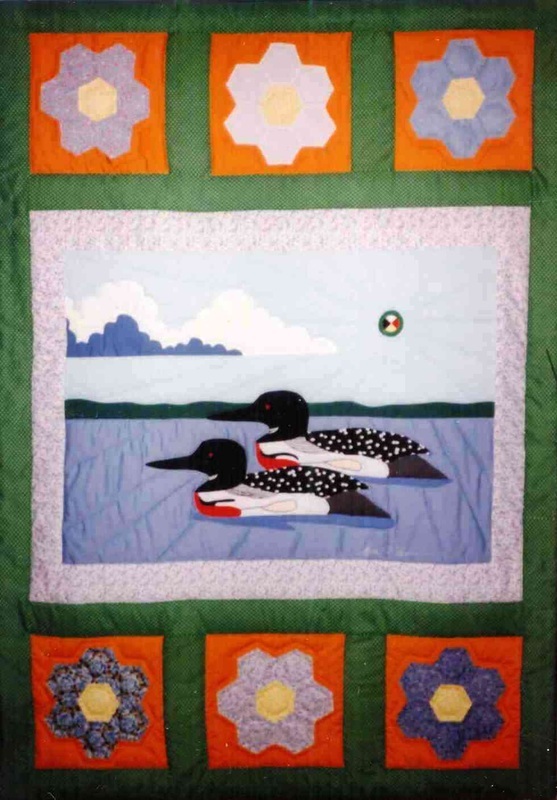 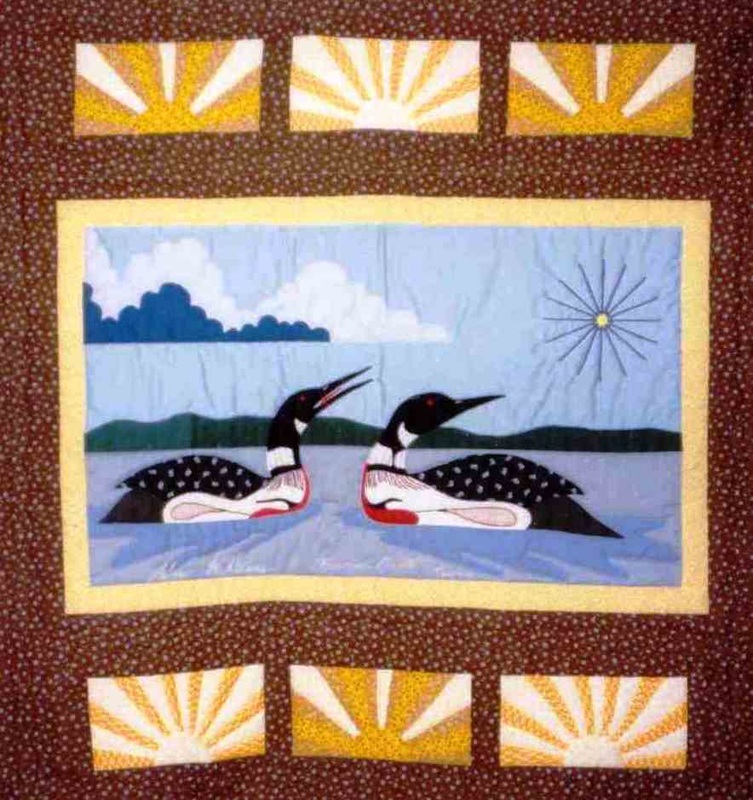 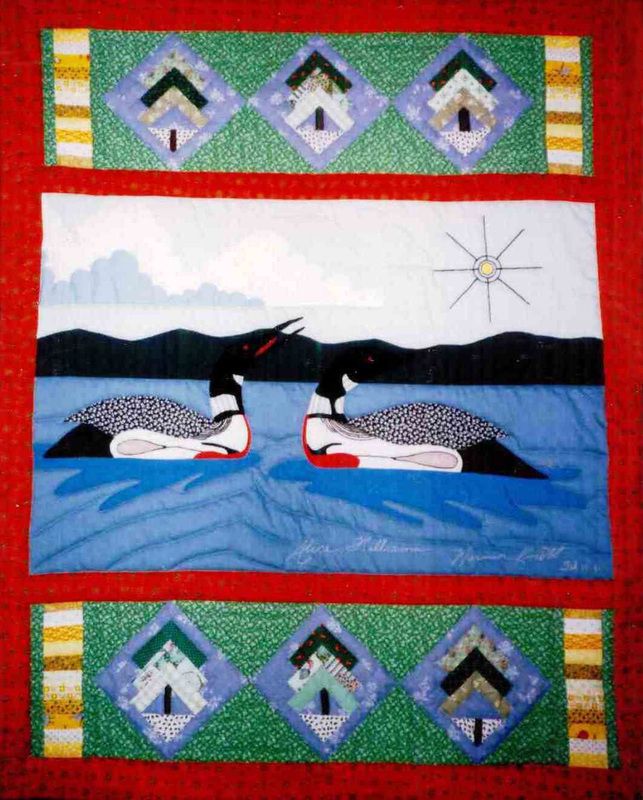 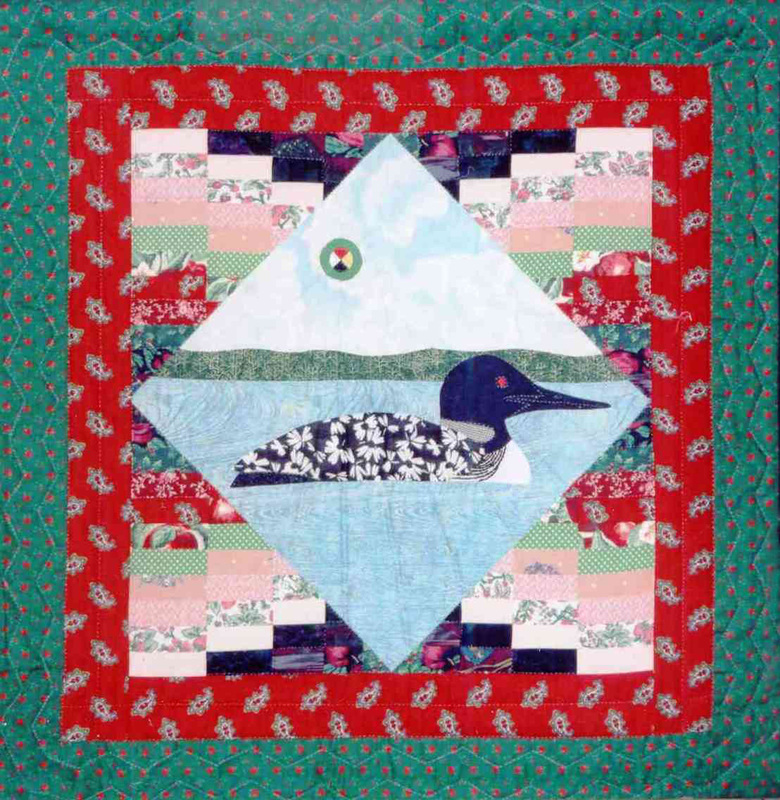 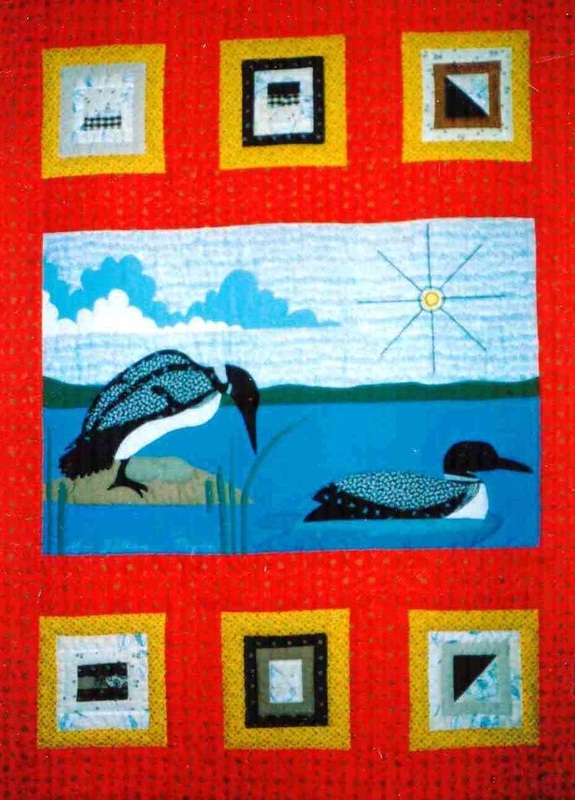 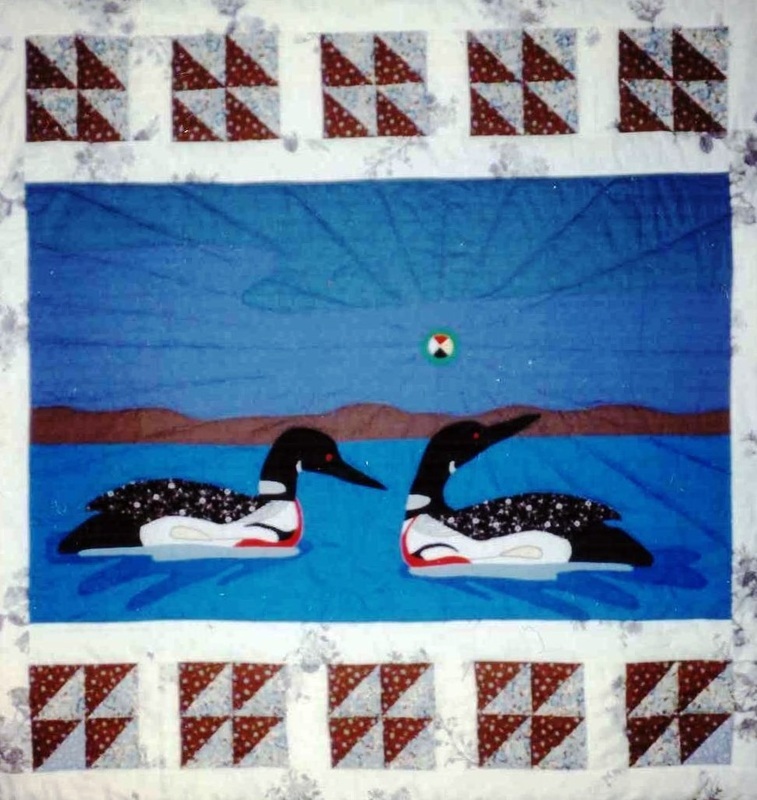 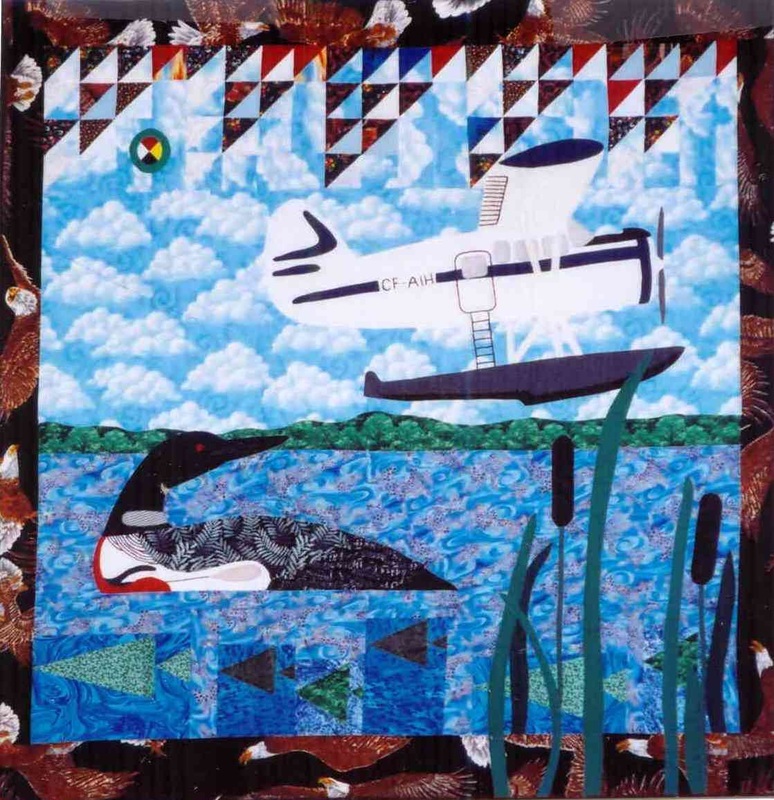 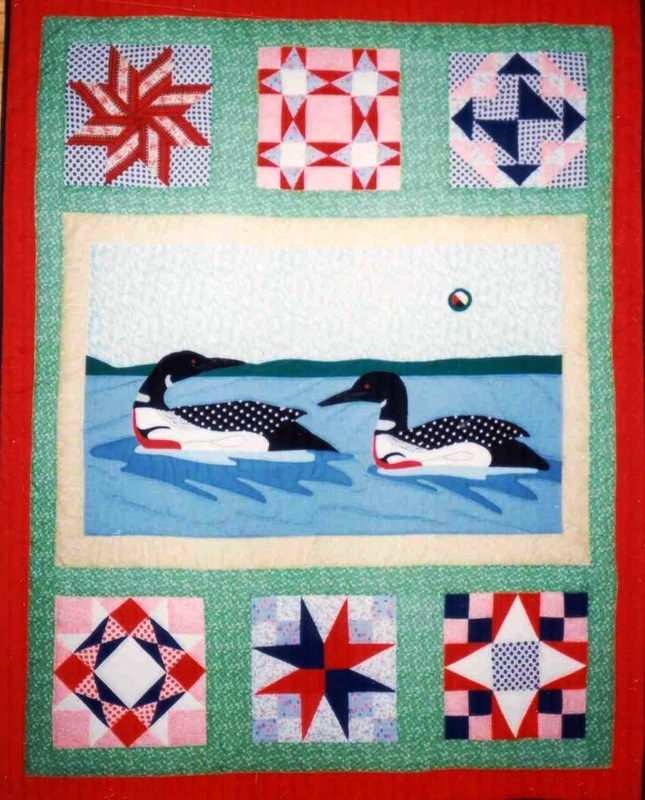 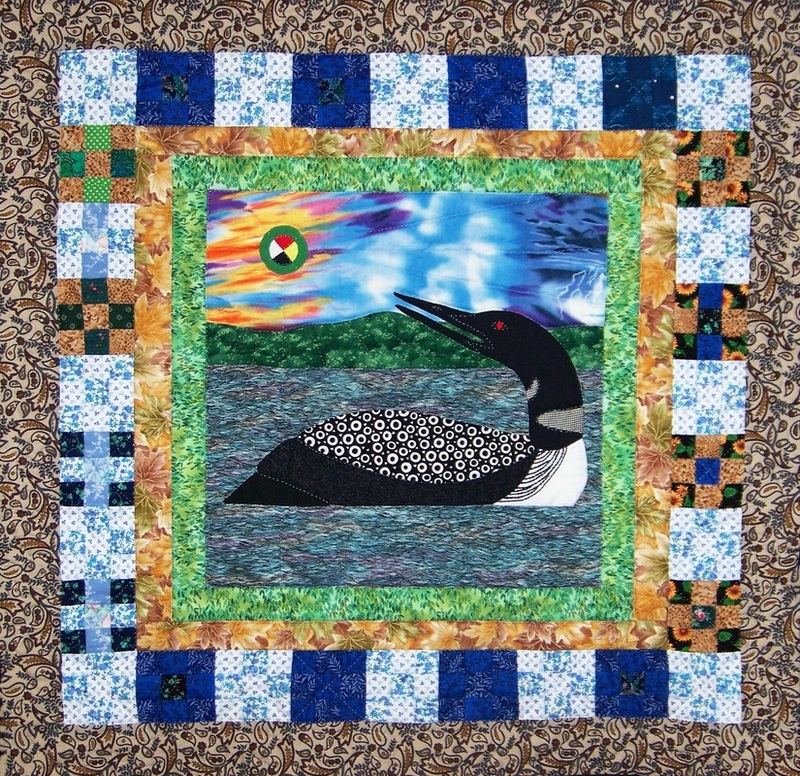 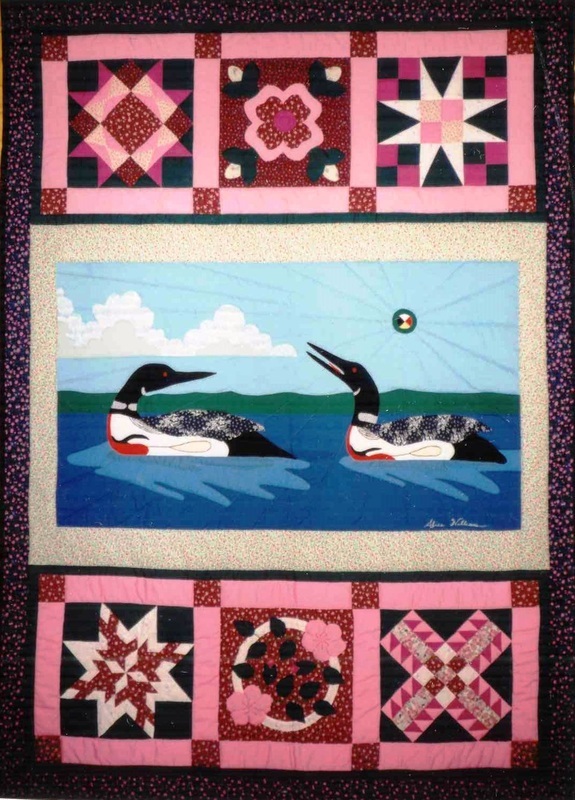 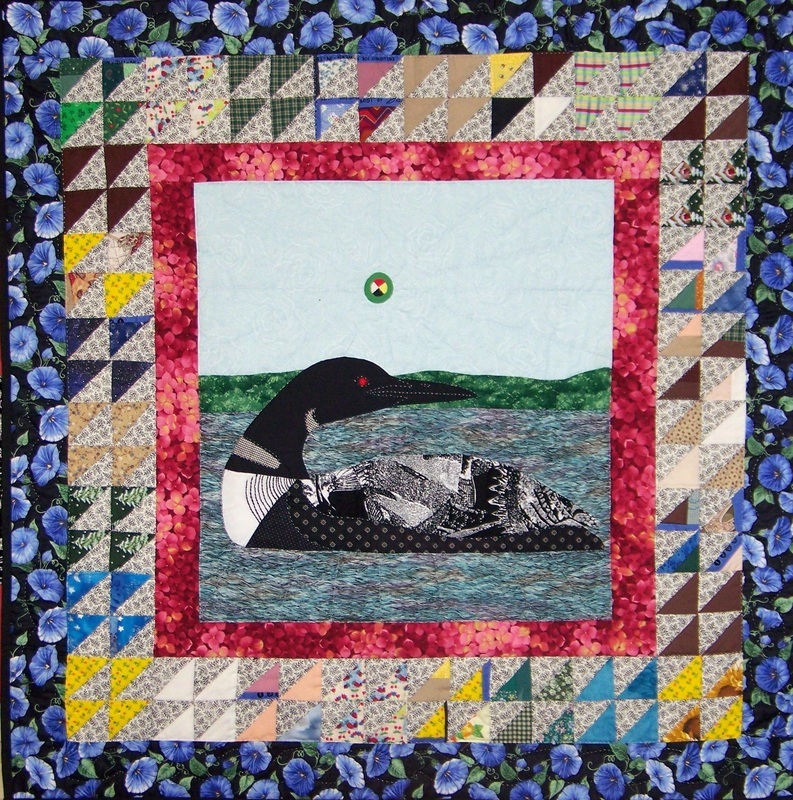 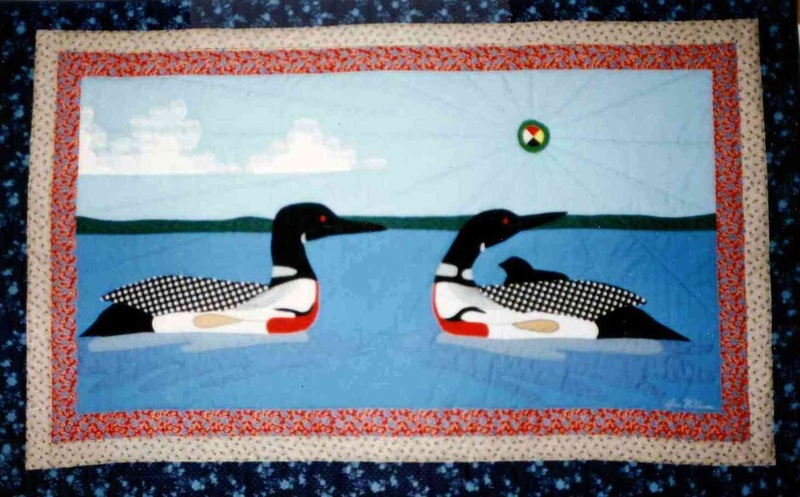 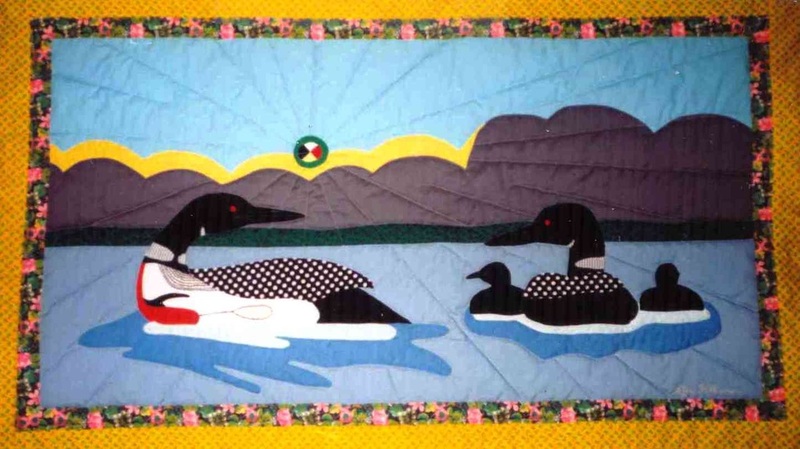 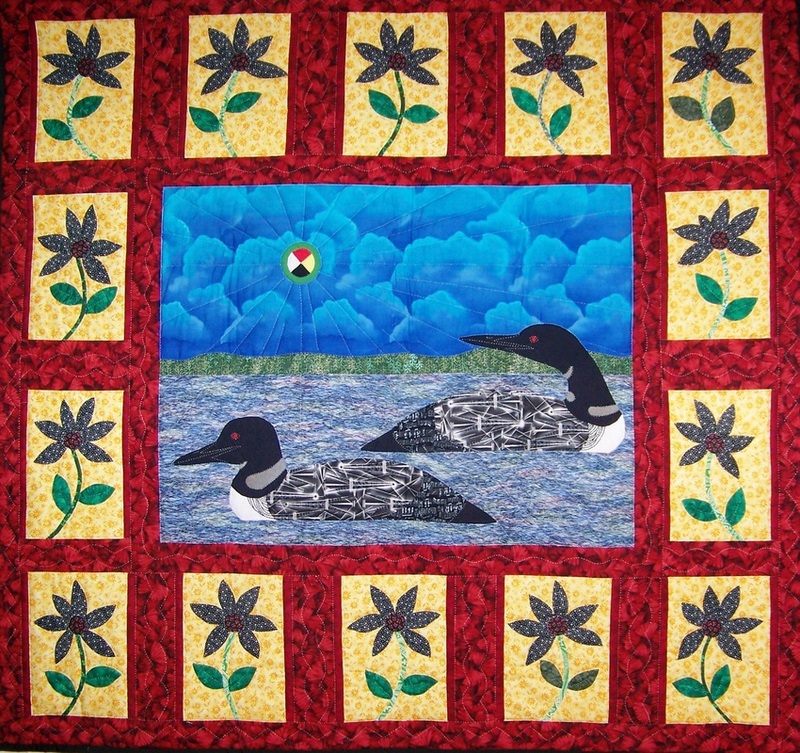 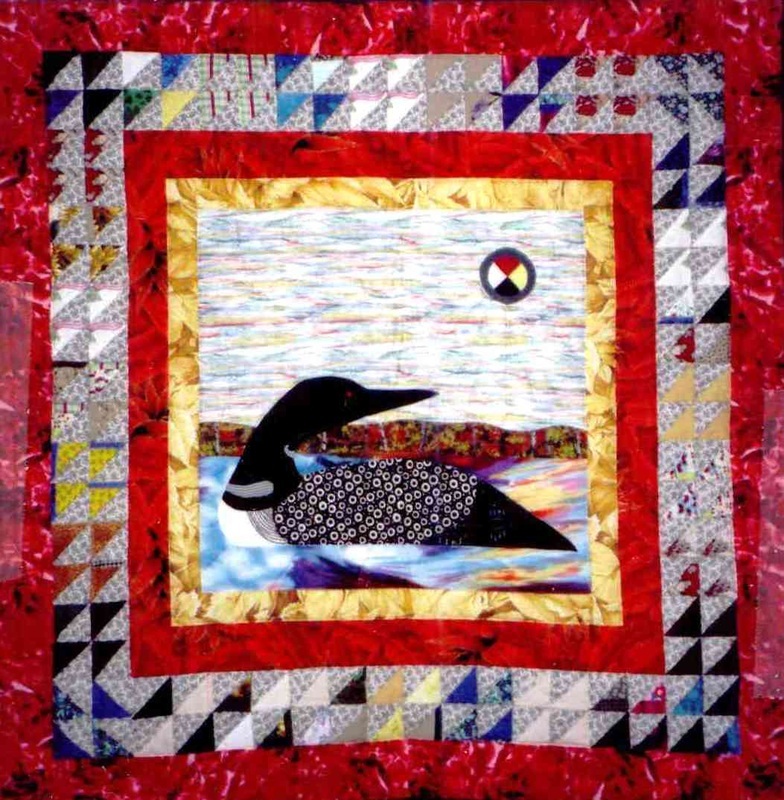 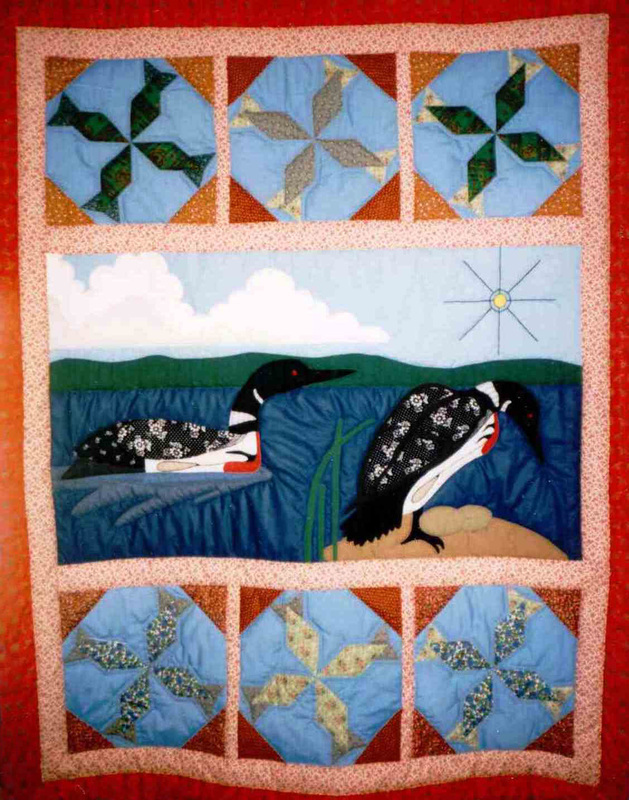 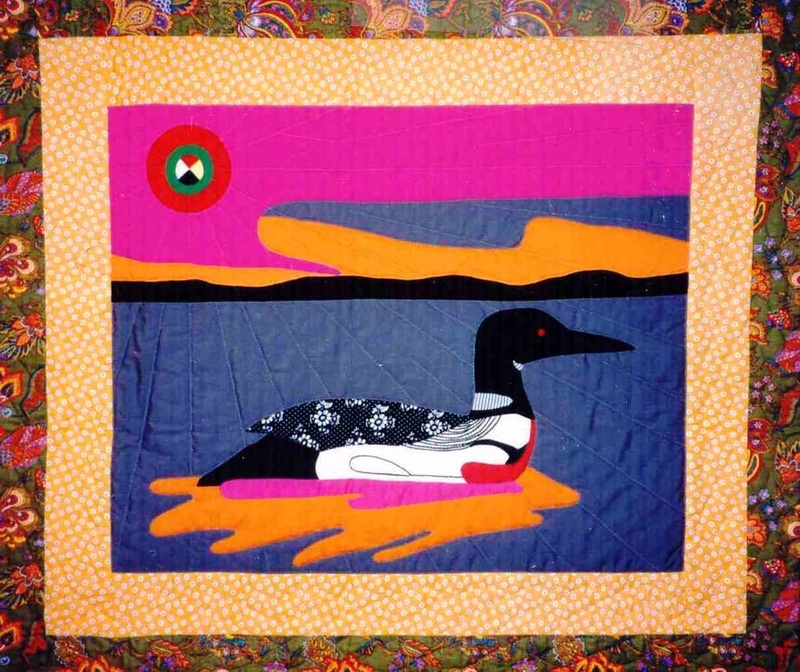 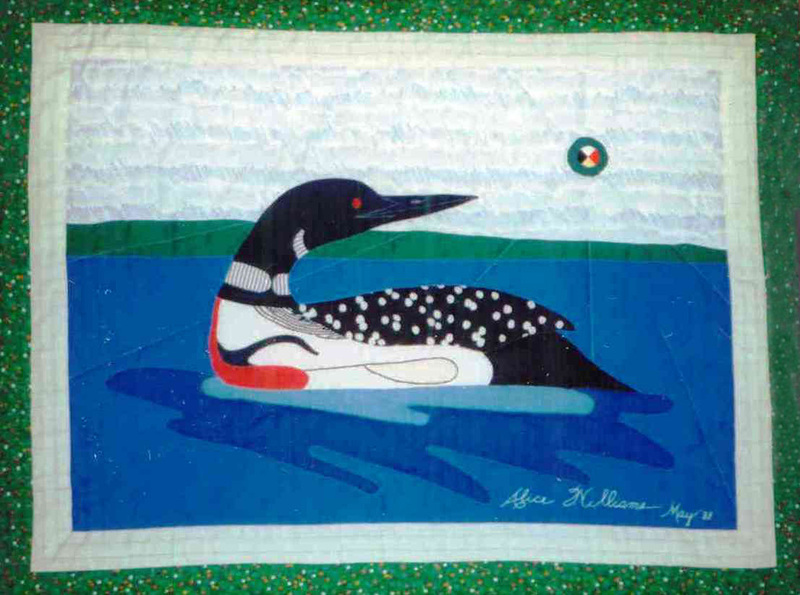 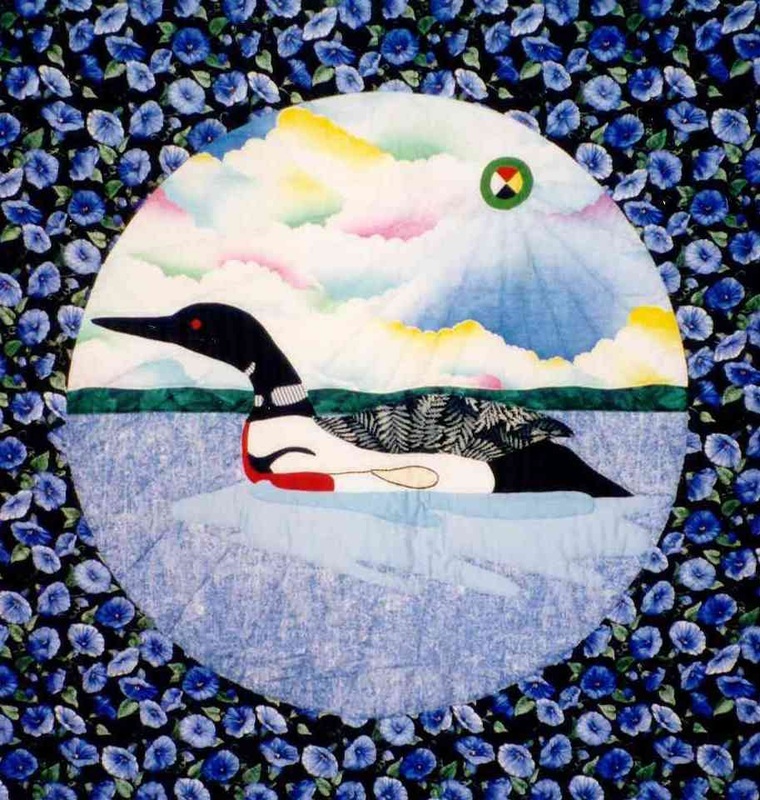 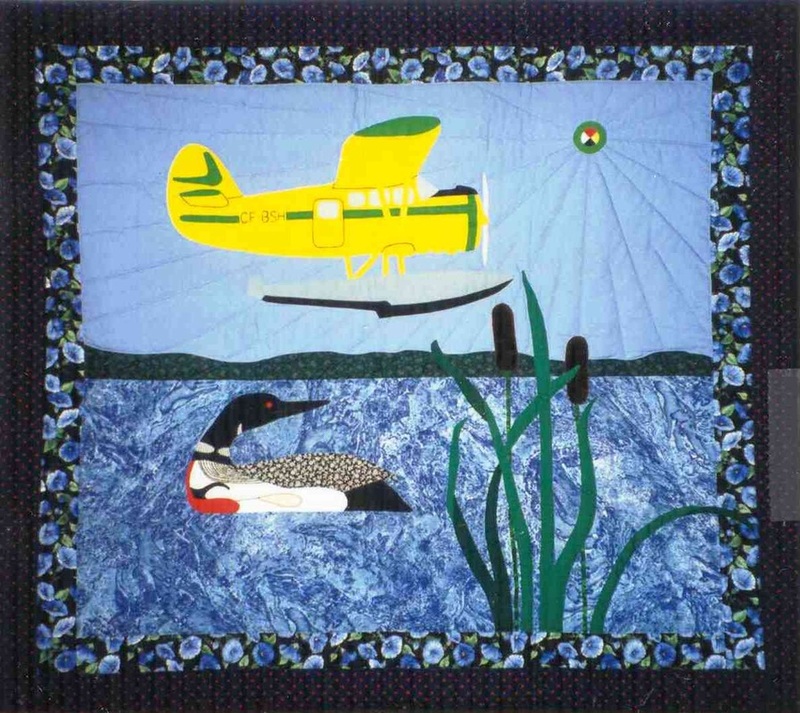 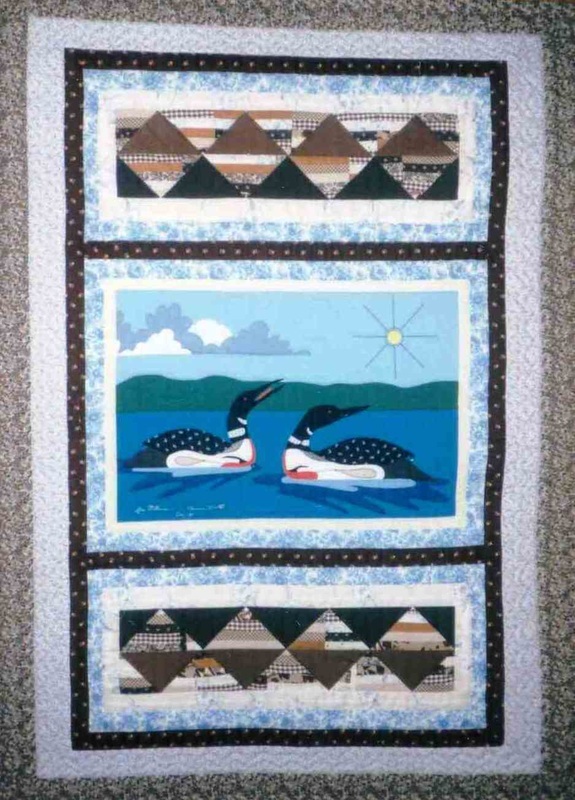 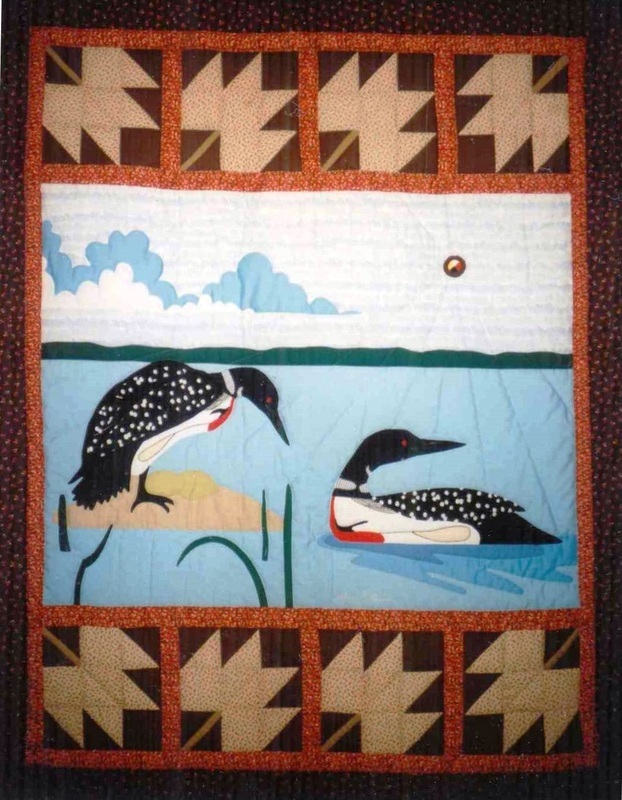 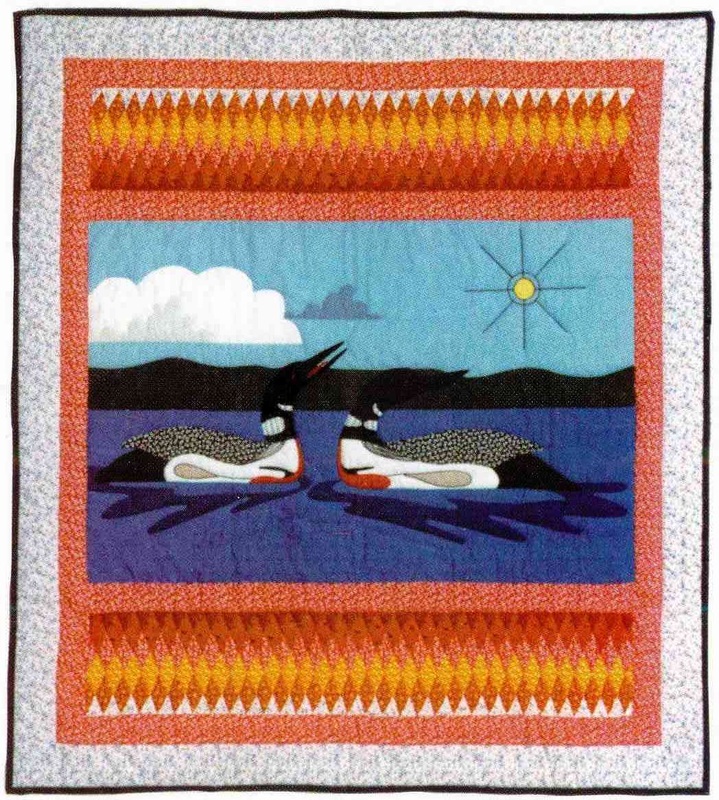 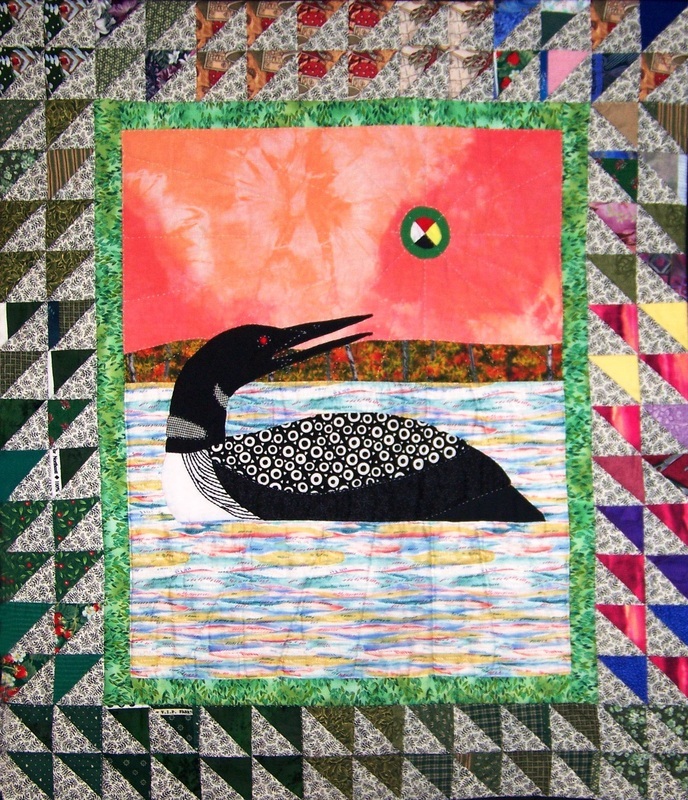 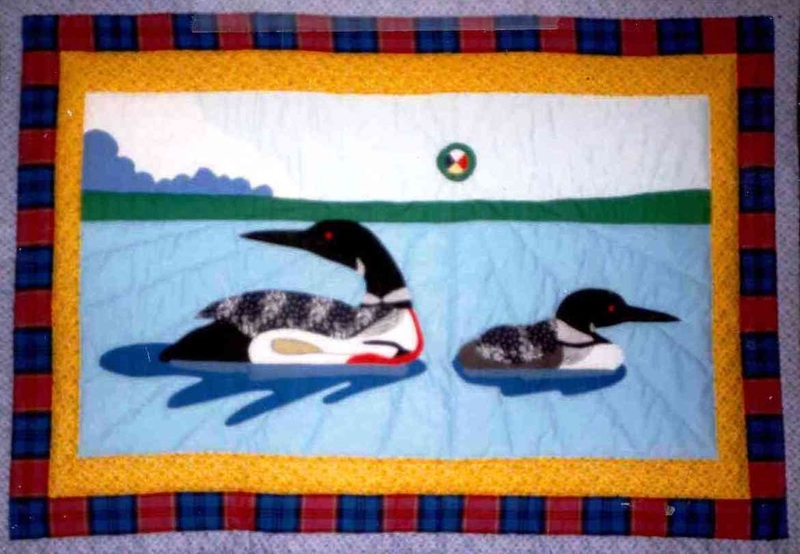 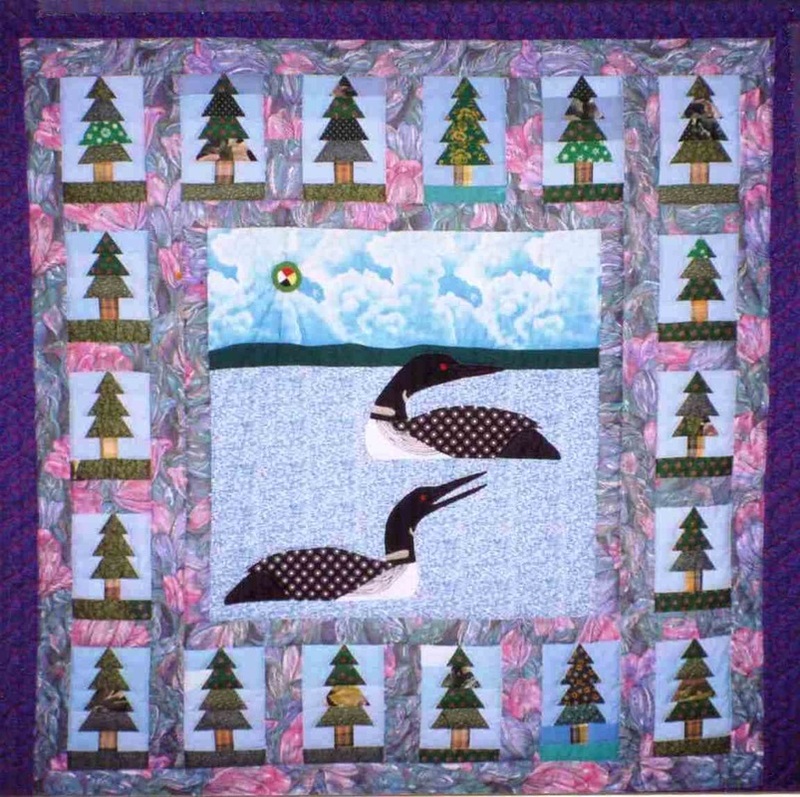 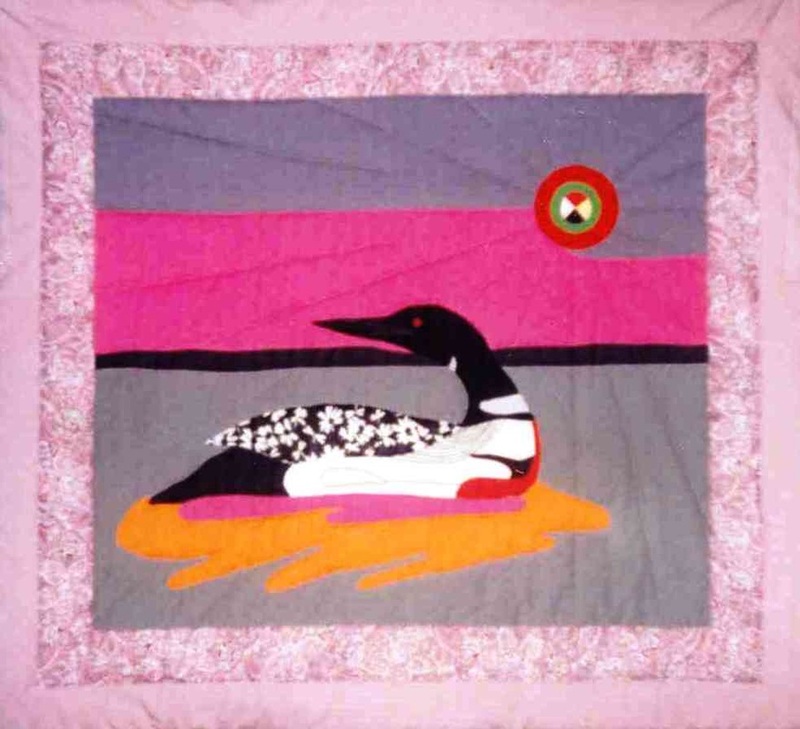 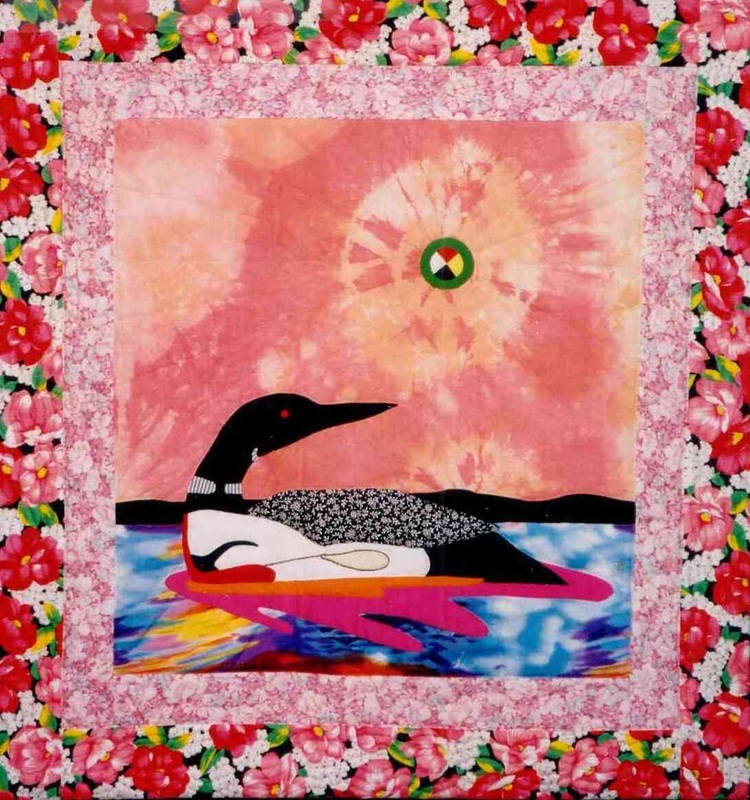 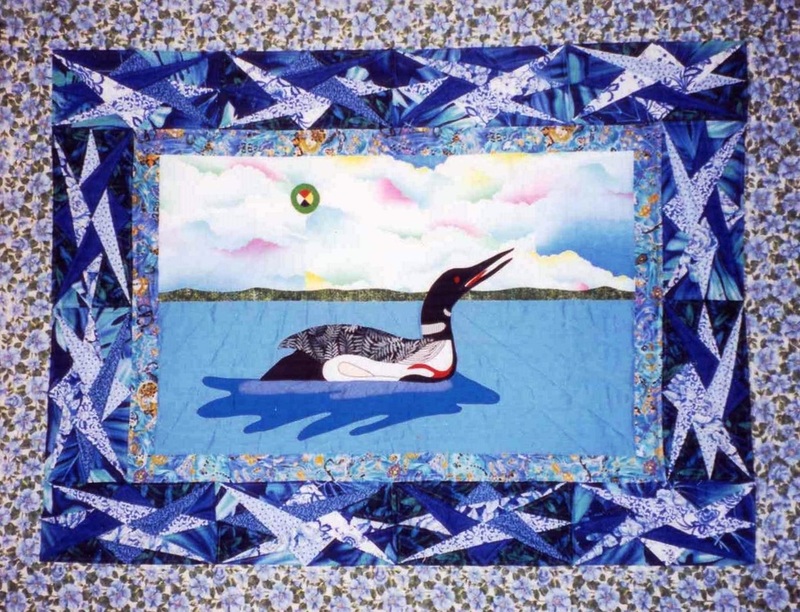 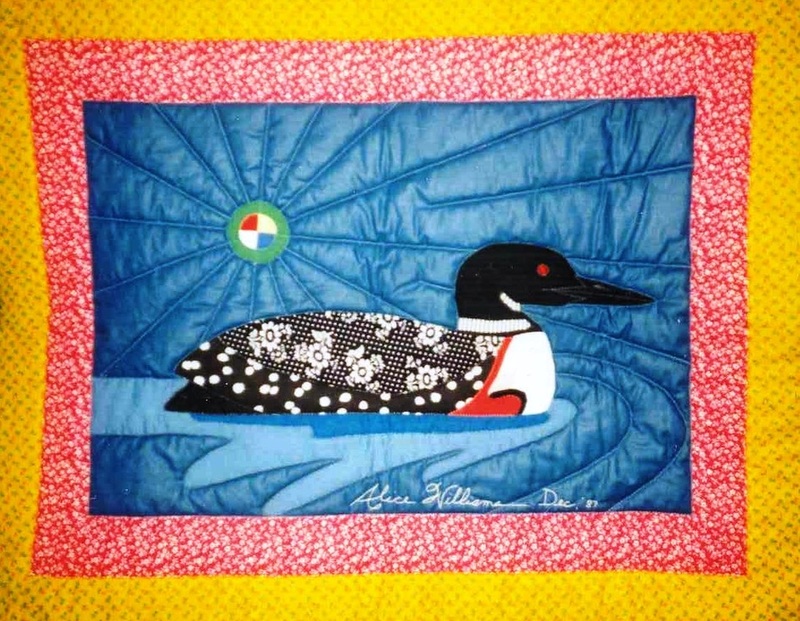 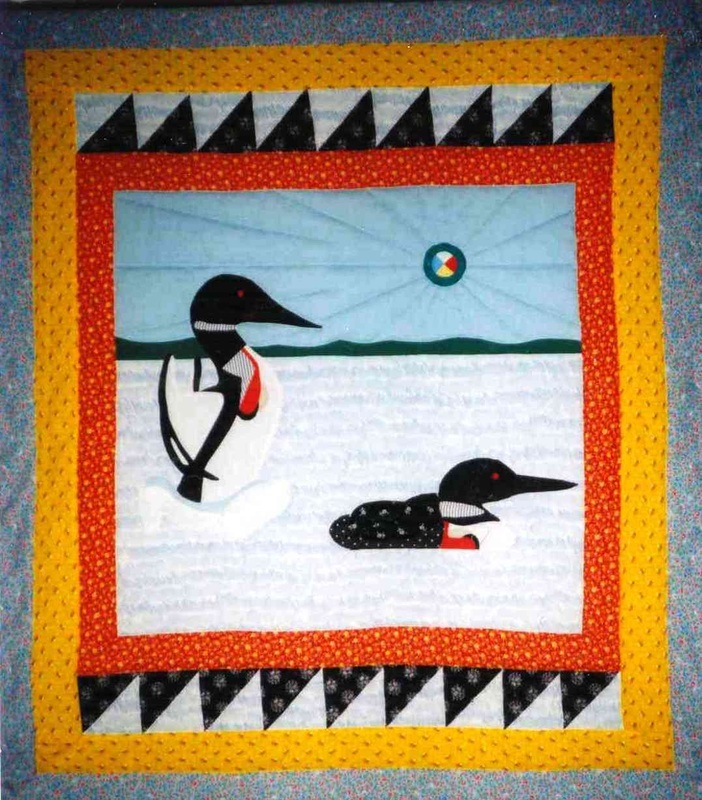 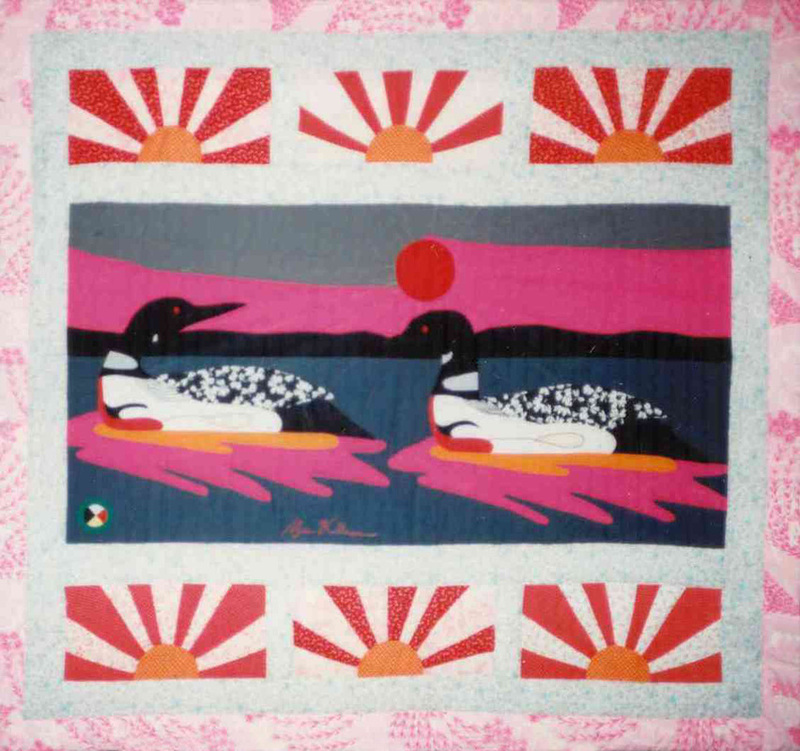 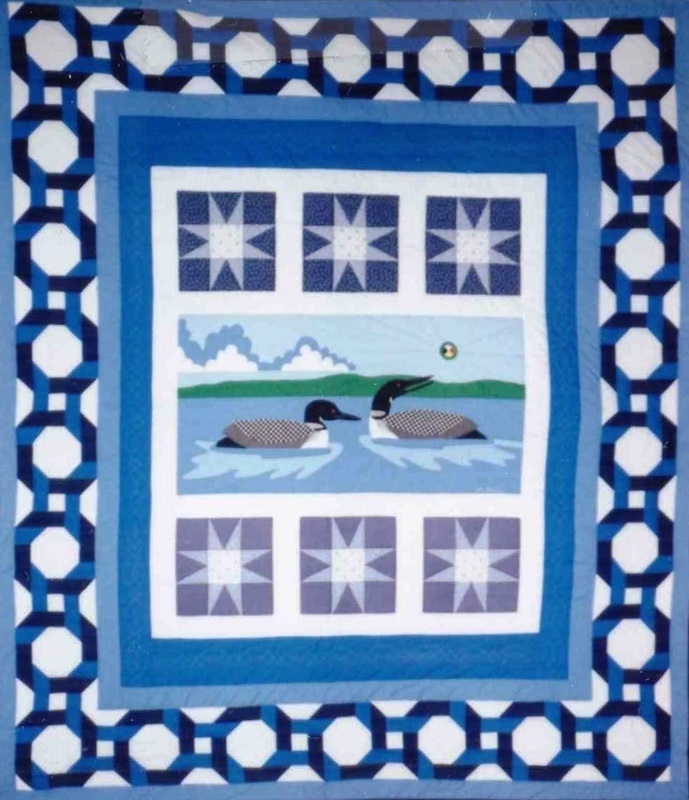 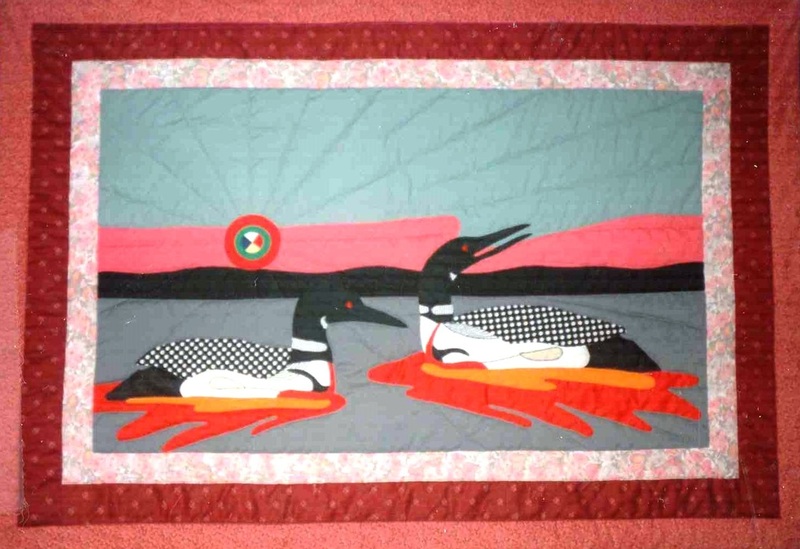 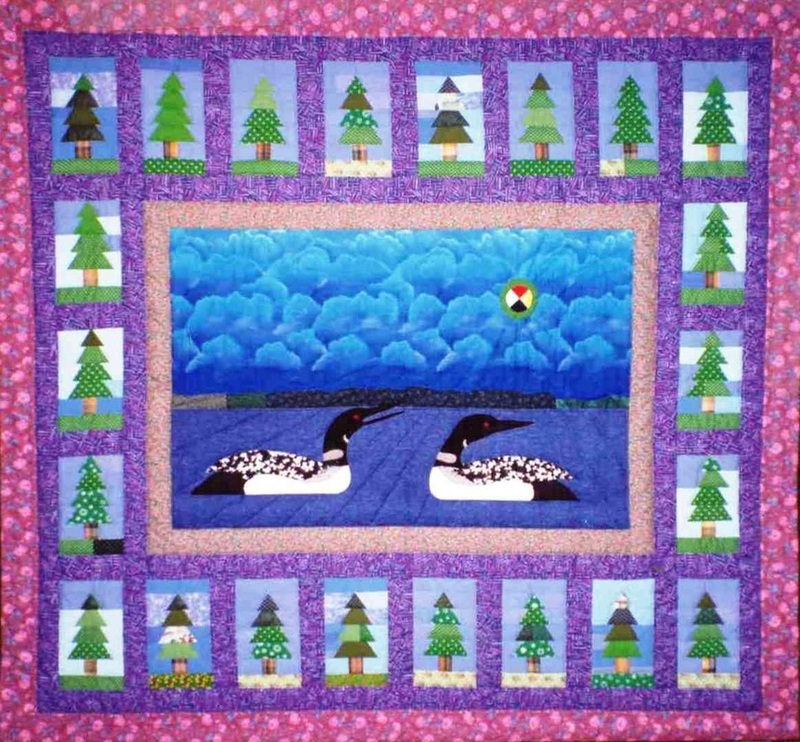 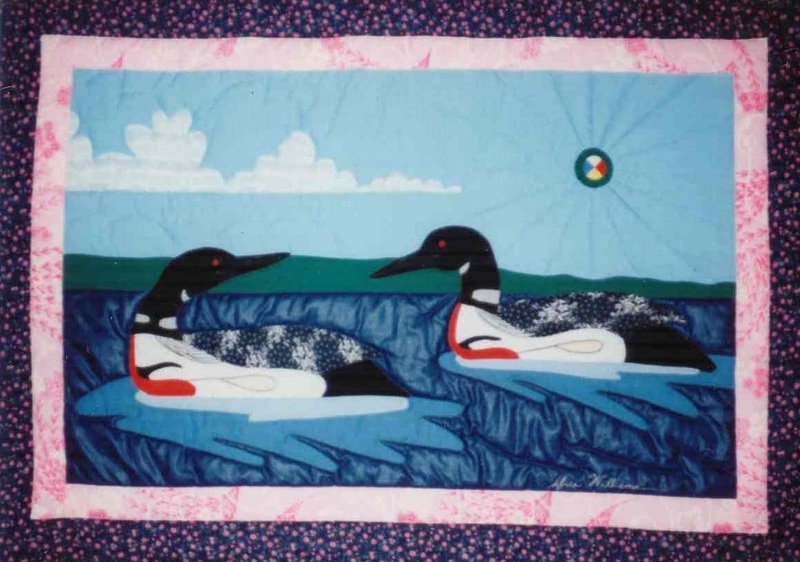 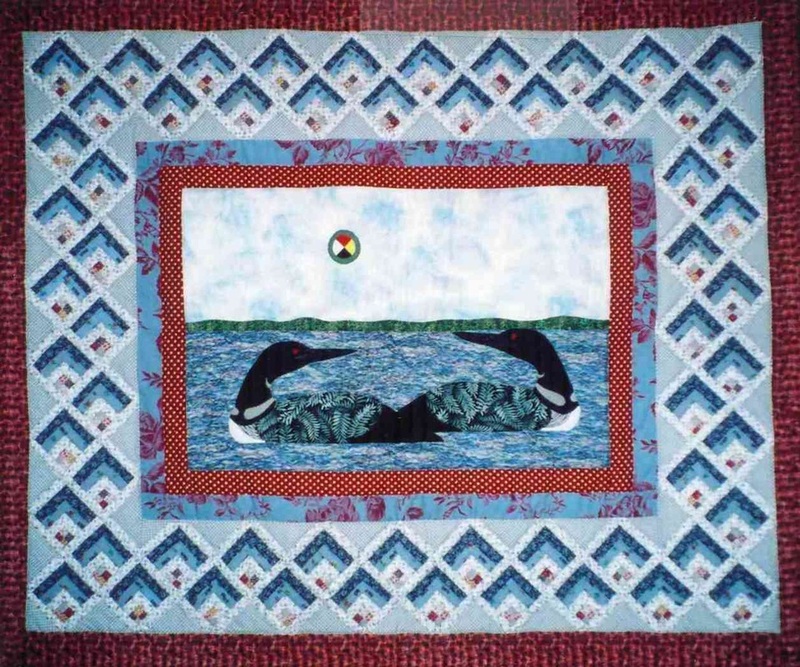 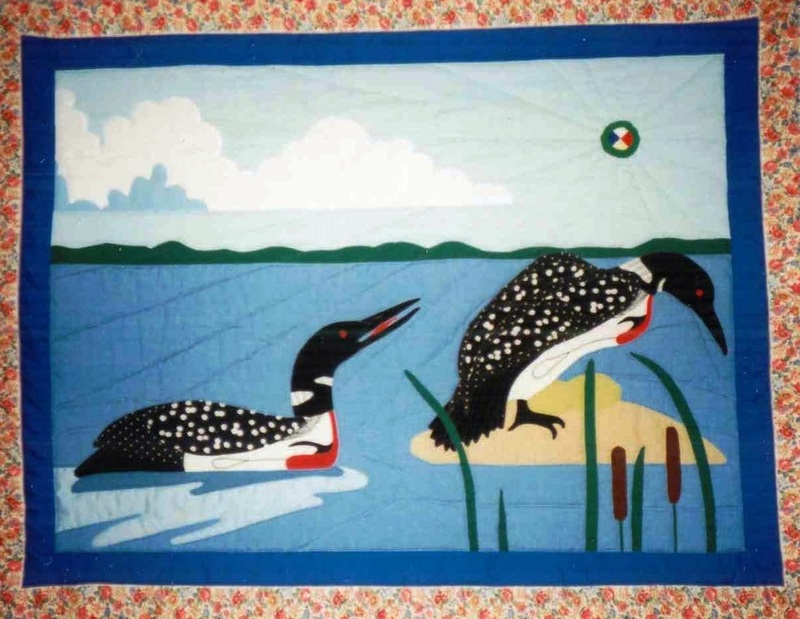 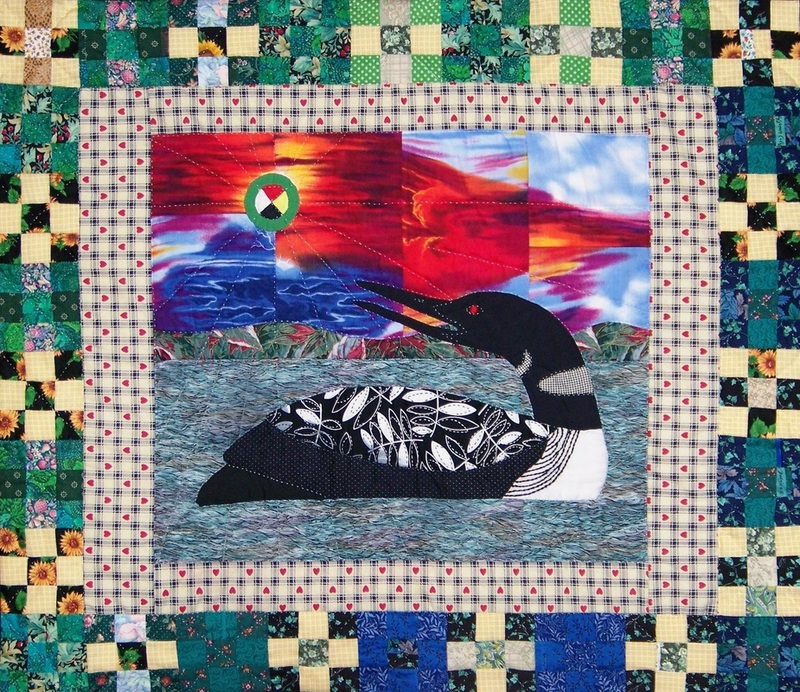 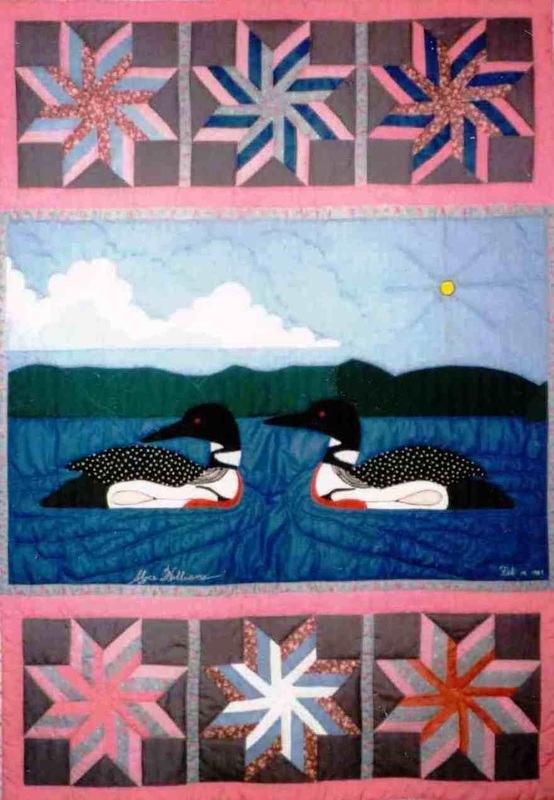 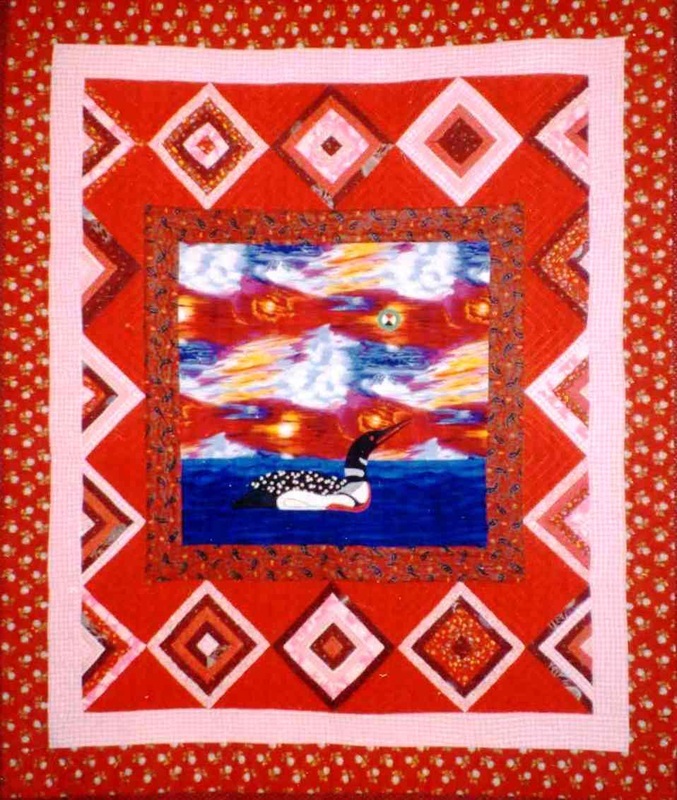 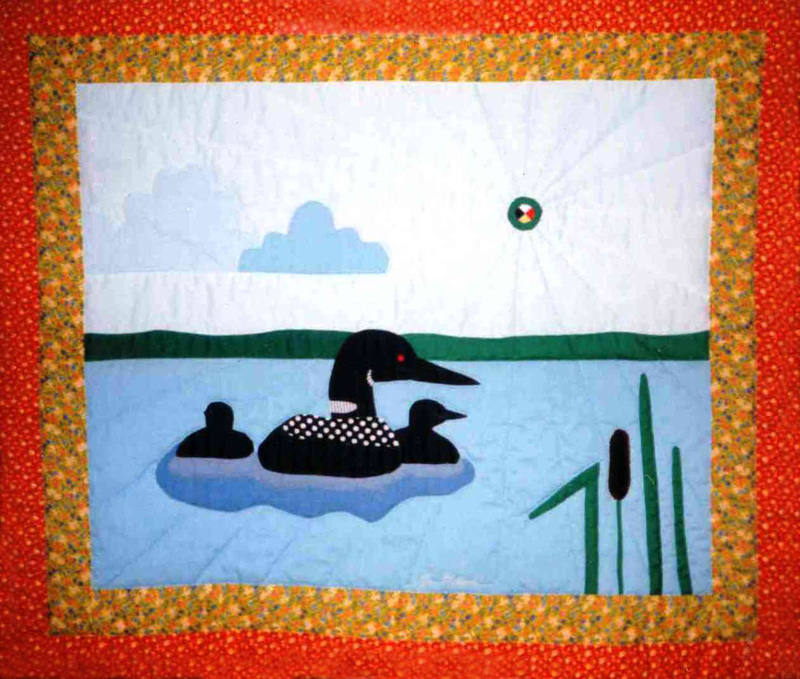 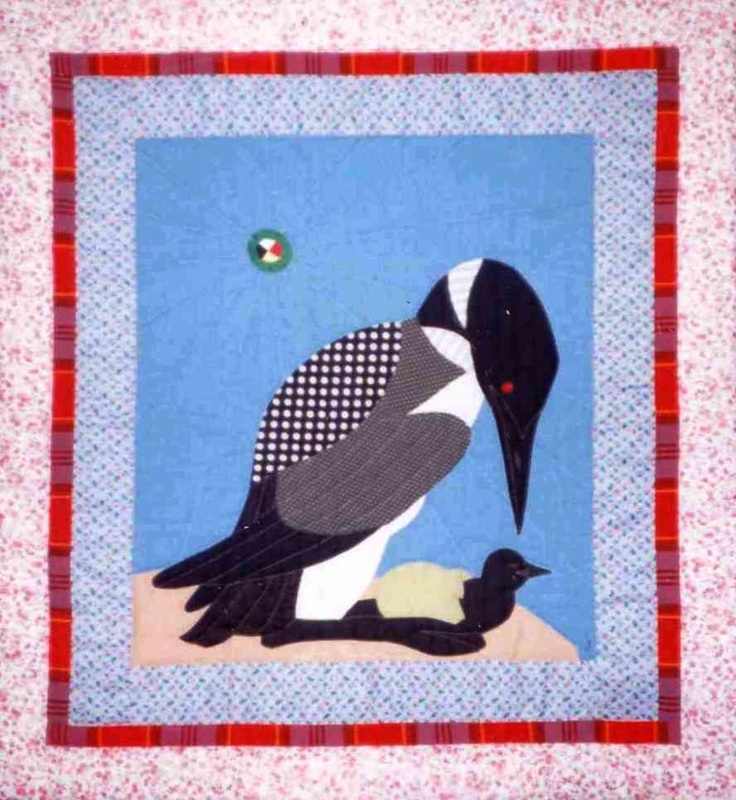 Also evident is her love for loons, and each quilt in this dynamic series evokes the beauty and sacredness of the watersheds in the Kawarthas, the place she calls home. 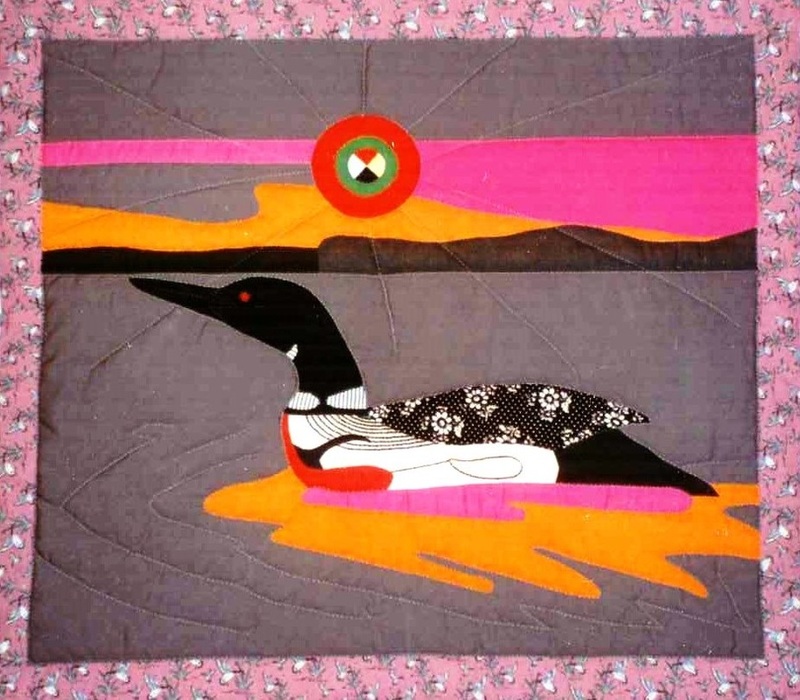 Collection of Canadian Woman Studies 33x37"
"Watching Out for the Storm"
Collected Works Gallery, Toronto 44x51"
"Reminder for R & R"
Collection of Peter Kulchyski 79x94.5"
Collection of Curve Lake First Nation 38.5x54"
Collection of Curve Lake First Nation 35x53"
"Sharing is a traditional Anishinaabe value, and Norman Knott, a well-known artist from Curve Lake First Nation, was the one who first shared his Anishinaabe art forms and designs with me. 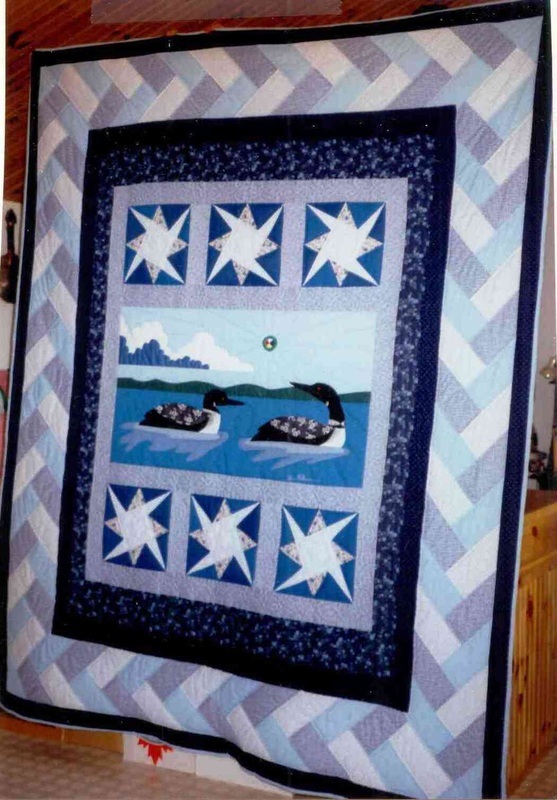 Because of his kindness and willingness to share, I was able to make a beginning in the distinctive way that I do my work. 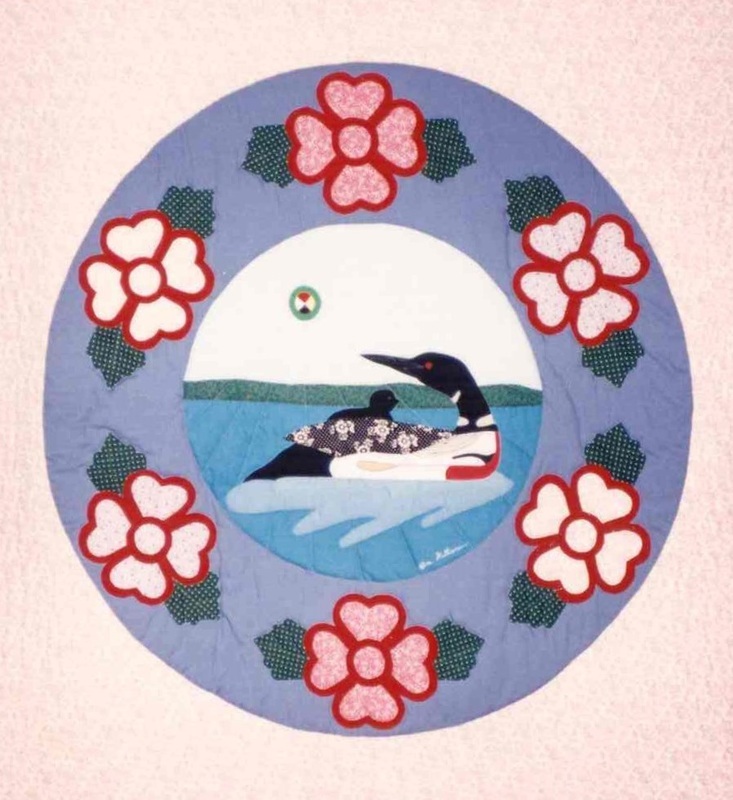 A traditional Anishinaabe art form is used to depict the loon. 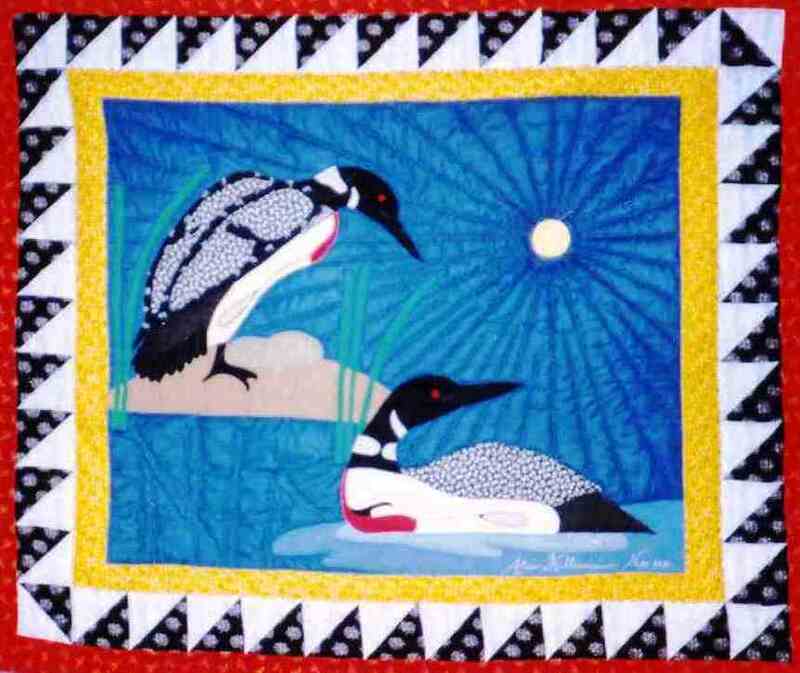 Using what anthropologists call 'a petroglyph style', I have shown how the Anishinaabeg understand and see the world around us. 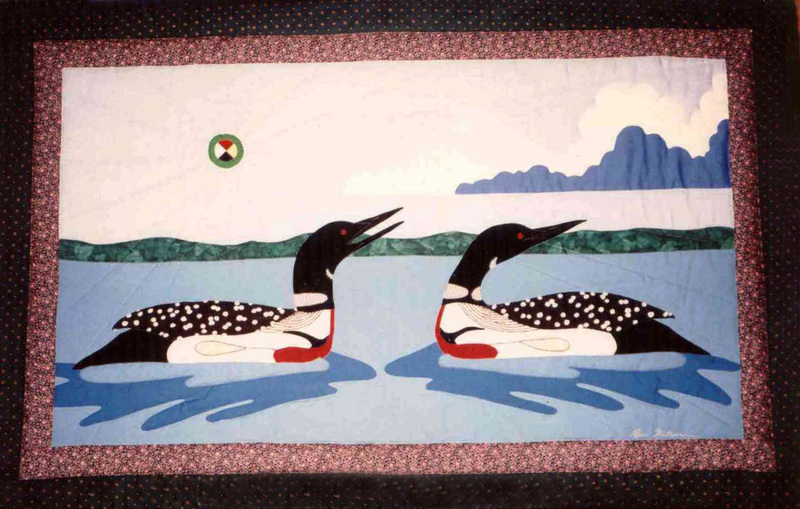 As with Norman Knott's paintings of our kindred spirits the birds and animals, it is the spirit that is important. 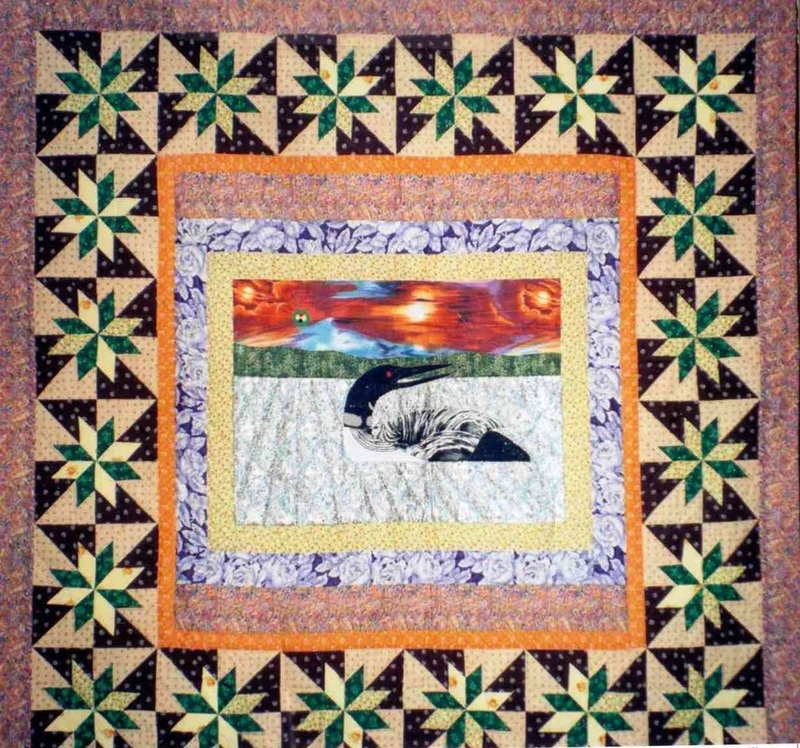 Then form is given to the spirit, so that one may know whose life is being depicted. 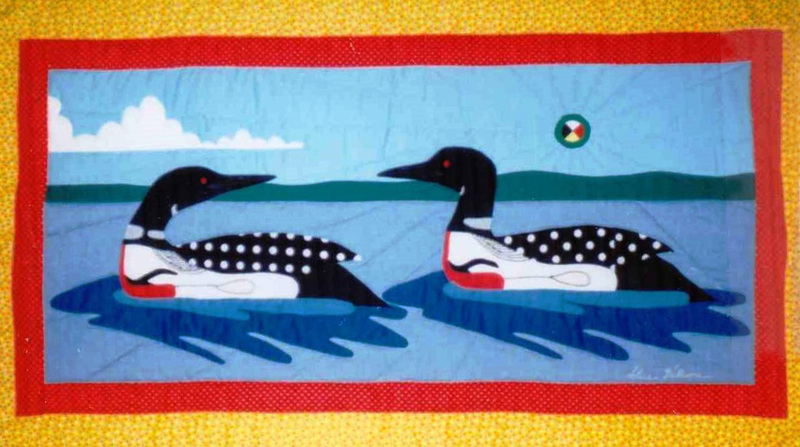 Chi Meegwetch Norman." 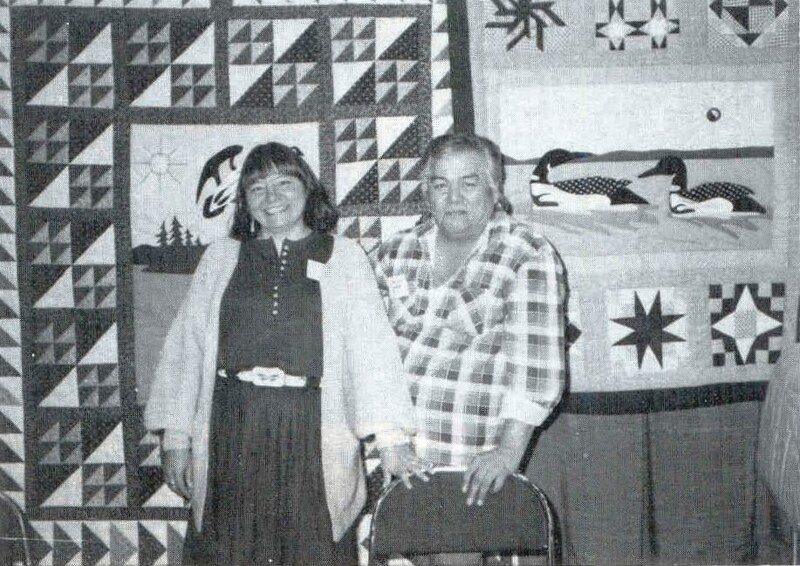 Alice writes about her collaboration with Norman Knott in her article "In Her Memory and in the Spirit of Our Ancestors" which appeared in the Canadian Woman Studies tribute to Margaret Laurence, 1987. 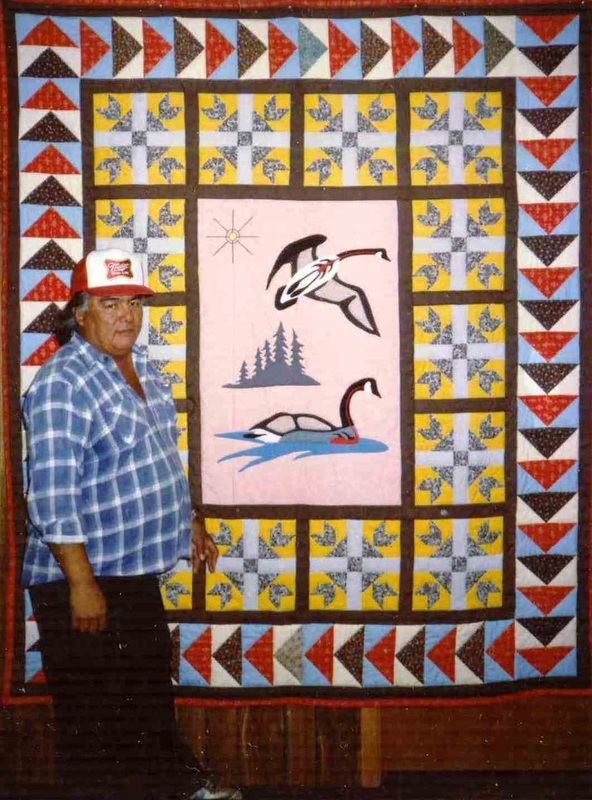 Collection of Elder William Commanda, 54x54"